Canada is an awesome country. I haven’t seen a lot of Canada yet but I like what I’ve seen. We arrived about a week ago and we are staying in our great aunt and uncle’s house – but we call them grandparents – Yiayia and Papou. It’s a pretty big house actually – it’s got an upstairs where everyone sleeps. When you go up the stairs and the first door you see is where Emilio and I sleep. Then the door next to it is the washroom as the Canadians call the bathroom. Sometimes when we ask for the toilet people think it’s a bit funny. There’s a basement which is where we usually hang out and do our school work and spend lots of time there. We are allowed to watch telly here in the afternoon and they’re are some really cool shows. Right now mummy is at a course that helps her to know and manage children better with their emotions, what they like and don’t like I think and how they see the world. She’s been gone for 5 days. 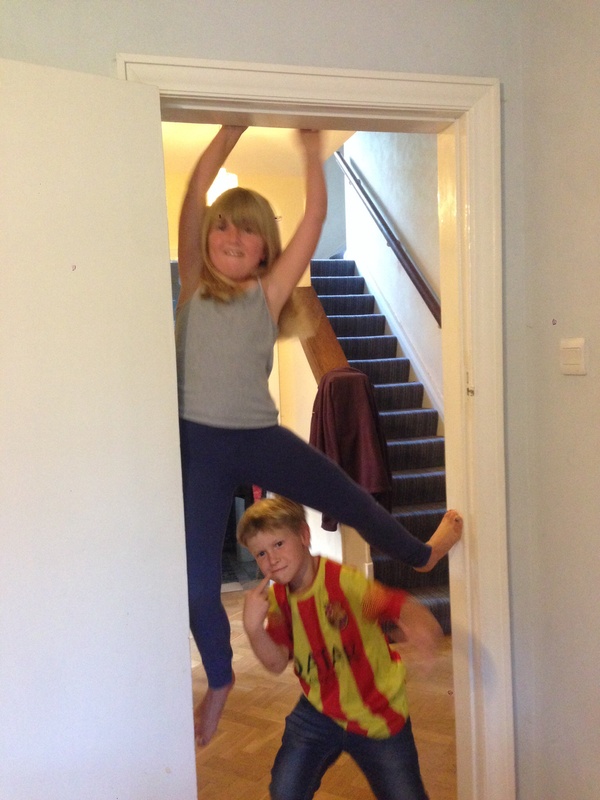 In those 5 days we have done 5 days of home school – so don’t worry kids we are keeping up with our schooling. We start school about 8am. Us big kids normally start with 5-10minutes of brain gym because our baba used to do it with his class when he was a teacher at high school and it helped his students be wiser when they did their tests. Then we do half an hour of quiet reading and Yiayia Mary usually calls us for breakfast. We usually have toast or cereal and eggs. After our reading is done we do half an hour of writing – for instance we had to do different types from creative writing to journal writing to letter writing and blogging. Then comes my favourite – Maths – we have some really good new books that we bought at Walmart, to help with times tables and other things like that. We also have some really good games on our iPod called ‘King of maths’ and ‘Quick maths’. I do recommend it to other parents of you want your kids to practice maths. I’ve learnt a lot from them. Next we go on to Greek. Some of the things we’ve done in Greek this week is interview our Yiayia Mary and Papou Vangeli and some of their friends as well, in Greek, and then write the answers out in sentences. 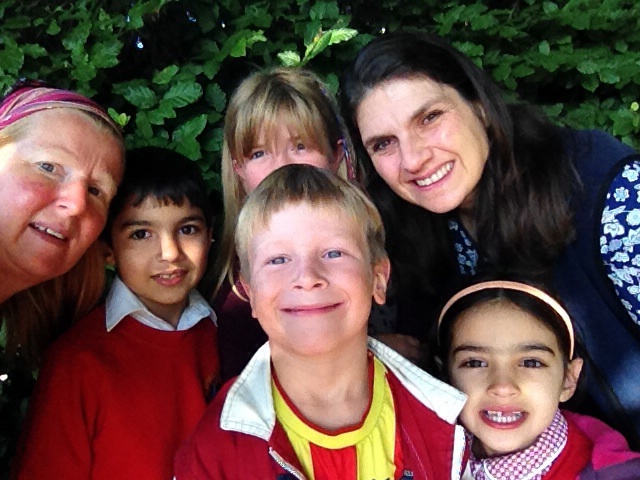 We’ve also written a letter to our wonderful private Greek teacher who we learnt a lot from. Her name is Kristalenia. Of course we wrote the letter in Greek – when baba corrects it we put it on the iPad and send it. We’ve also got some wonderful new books for reading and writing that baba bought at Walmart. They’re fun to work through but they’re still new. Every morning Yiayia and baba sit in the garage that looks onto the street, having a Greek coffee and they say it makes them feel like they’re in the village. She usually makes the coffee and yells for baba loudly or rings the bell lots of times so he comes out. 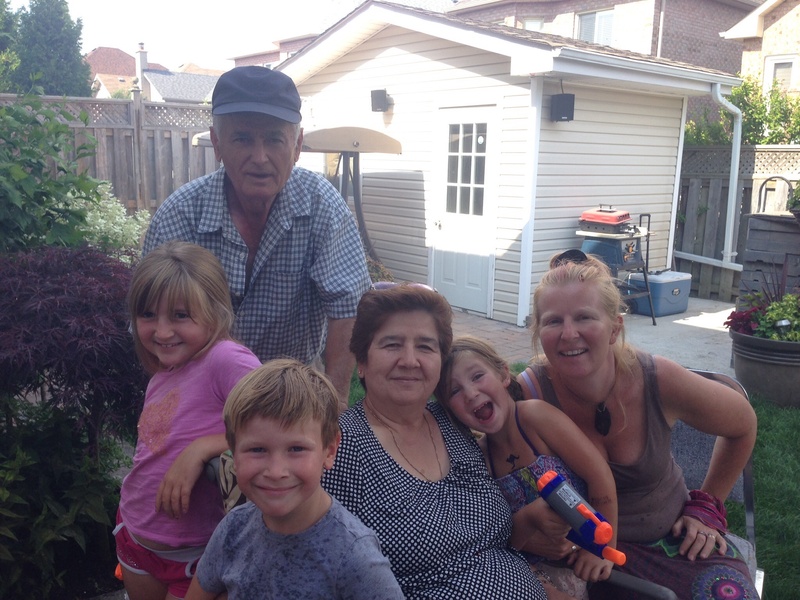 Susie and Nick are our uncle and aunt and are Yiayia Mary and Pappou Vangeli’s kids. We went to Uncle Nick’s and Aunty Vicky’s place on the weekend on Saturday night and it was extremely fun. 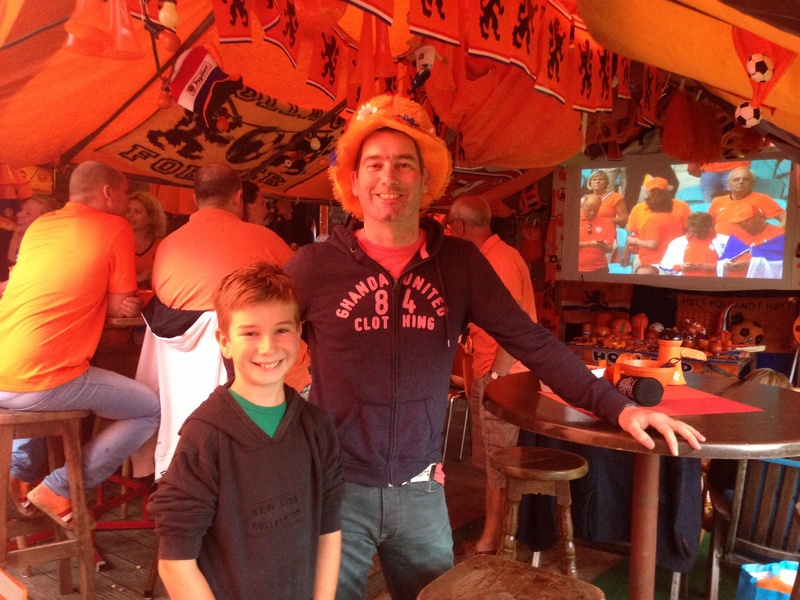 It was the day of the 3rd place for the World Cup and we got to watch all of that – I was sad about Brazil and seeing Neymar on the bench but I feel happy for Holland – especially cause we have just been there. 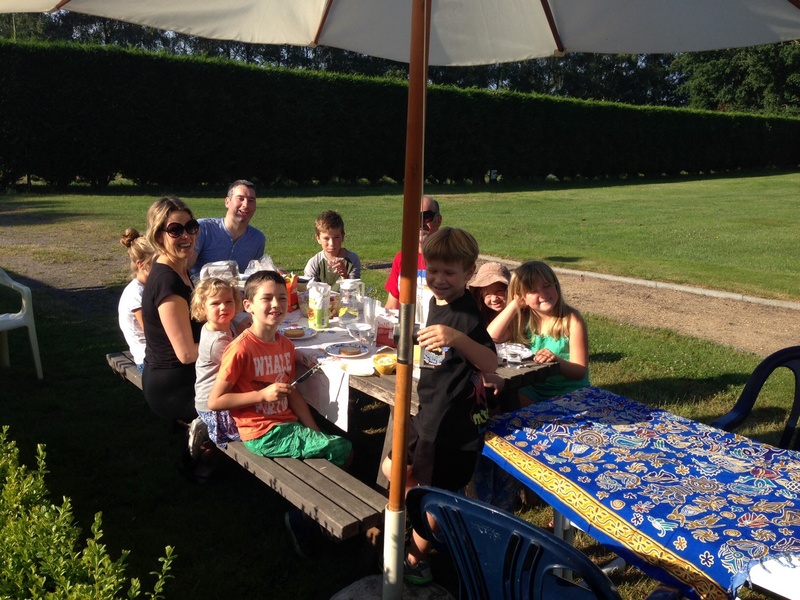 The food was also delicious – we love BBQs because we just love BBQs and meat. Uncle Nick also let us have about 100 DVDs – even Alvin and the chipmunks. My three favourite movies that he gave us are Alvin and the chipmunks 1 and 3 and also Beverley Hills Chihuahua 3. I got to play Xbox with my cousin Evan which was so cool. We played soccer and it was awesome even though it was my first time playing soccer on the Xbox. Firstly it’s my first time because we don’t have an Xbox and my dad doesn’t let us play computer games unless we are visiting people or if it’s in OSH (after school care). He thinks we should play soccer outside not on a Screen. 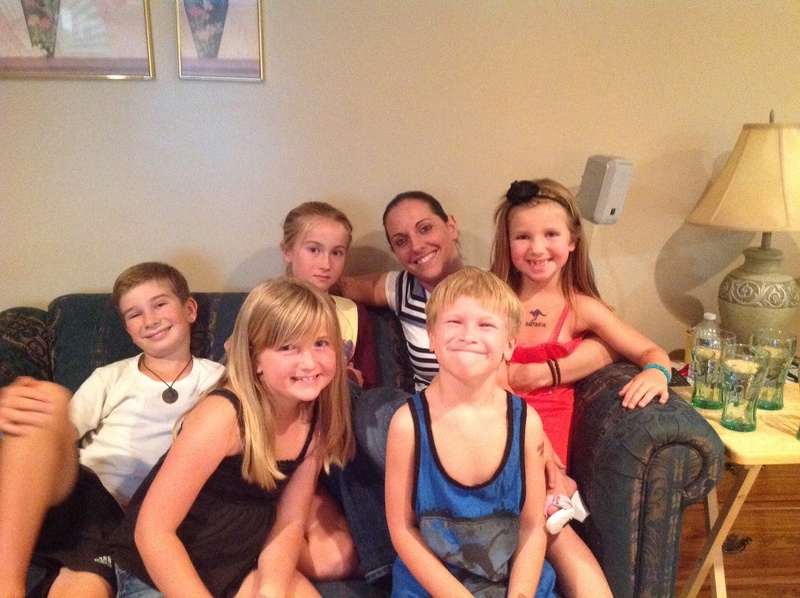 We also went to Aunty Susie’s and Uncle Matt’s place a couple of nights ago for a pizza night. It was absolutely cool and delicious. Aunty Susie showed us some photos of baba at her wedding and other photos. It was weird seeing my baba posing for photos when he was a teenager and he had lots of hair. Yesterday we had some visitors who were also cousins and my baba knew them lots when he was younger. They were Mary and Helen who had kids about 14 years old except one girl Lia was three years old. She was very cute and light as a feather. Mary and Helen’s parents are Yiayia Fani and Papou Apostoli. Apostoli and Papou Vangeli are brothers. It was good having other kids around that were sort of our age to play with. Emilio was playing Lego with two of the boys Nick and Joseph and was attacking them with pillows. 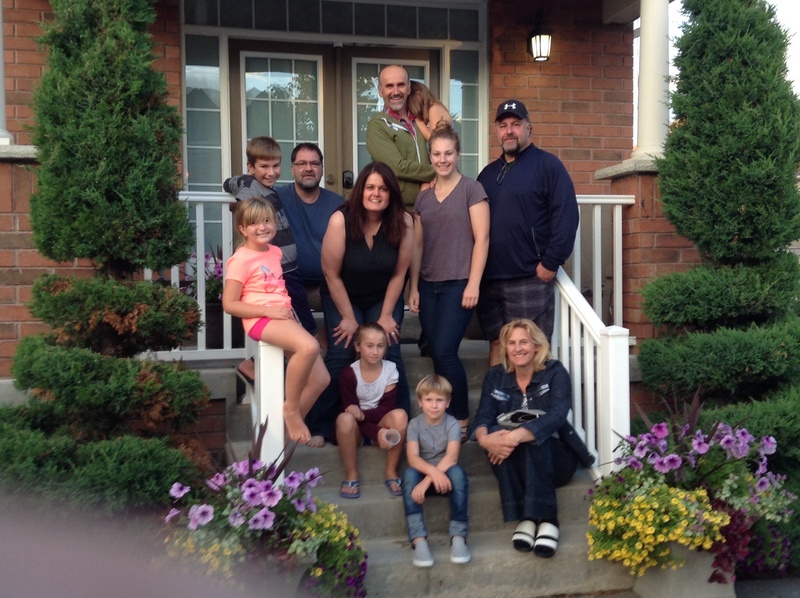 We went to our other cousins place – Cyndi – and had lunch with her. 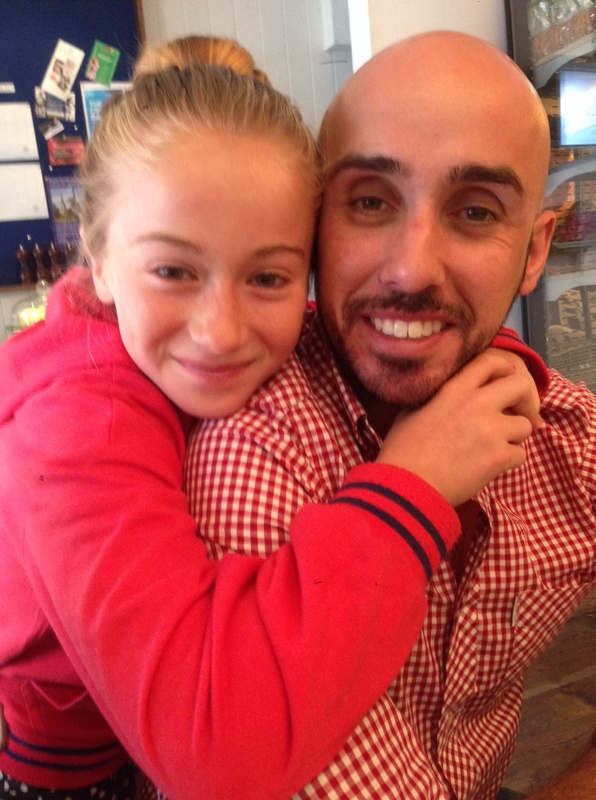 It was sad cause her mum Thia Souli was in Greece so we didn’t get to meet her. But they had an awesome place and we watched the World Cup final game together. I have watched lots of World Cup matches this time. My love affair with Toronto began on November 14, 1986. Well I really should say it’s the day that I met and fell in love with my cousins and their whole extended family. 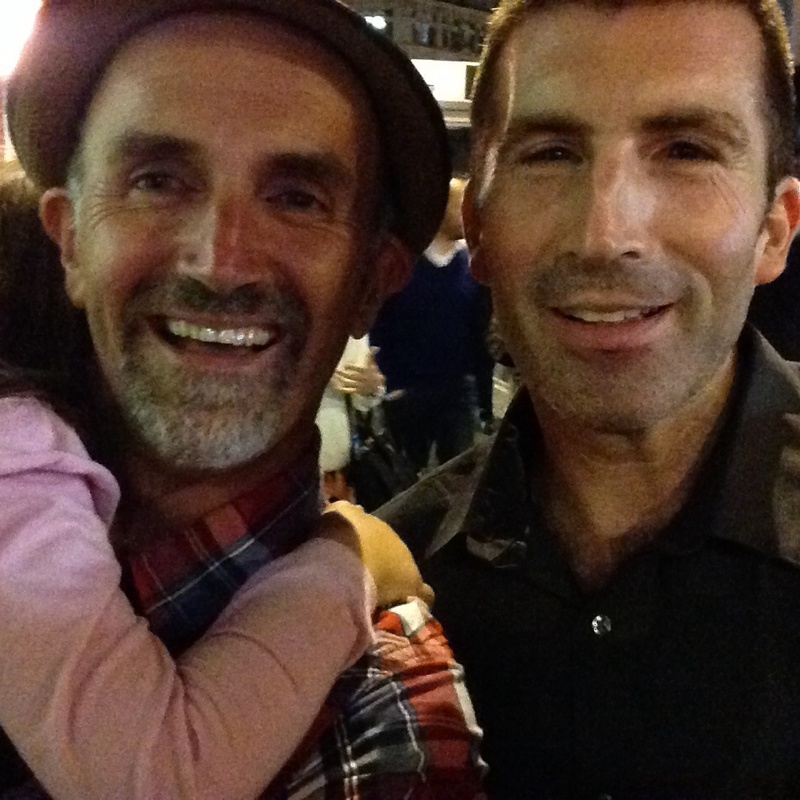 Don’t get me wrong – Toronto is a lovely city but a place takes on amazing life with amazing personal relationships. Anyway – I still remember that day like it was yesterday. I was only 16 years old and I hadn’t met these ‘Canadian cousins’ before. Since I was going to Greece for the summer holidays my dad mentioned that maybe I could go to Canada first and meet them. I jumped at the chance so we both went on the tram and almost skipped our way to Parthenon travel in Lonsdale st. Melbourne (yes you still had to get printed tickets from a Travel agent then). Before I new it I was sitting on a plane that seemed to stop at every island across the Pacific (well Fiji and Hawaii at any rate!) and 34 hours later I had arrived in Toronto airport. I was quite excited most of the trip but getting closer to Toronto I suddenly started getting really nervous. What is they weren’t there? What if I didn’t recognise them – the photos we had were a few years old! What if they didn’t like me and wanted me to leave? All the usual teenage fears overcome me. 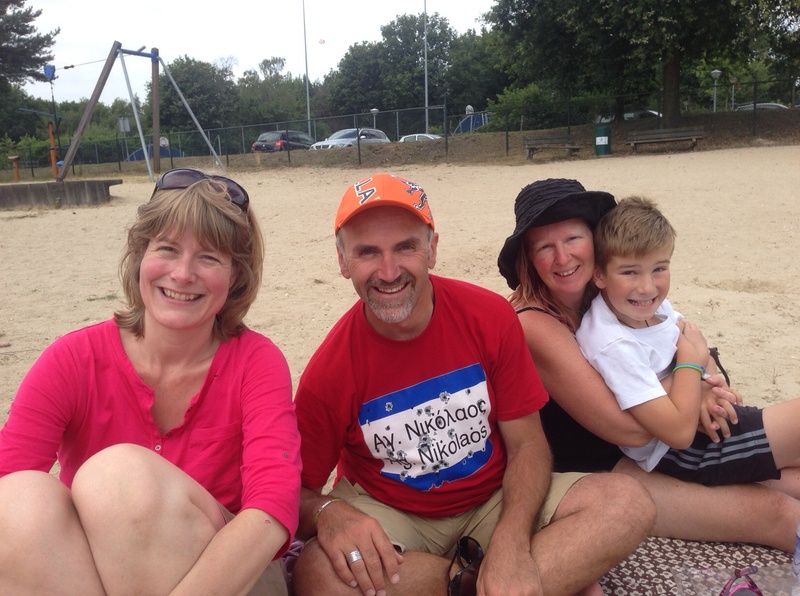 If they weren’t there – what would I do? This is before the Internet, before mobile phones. I guess I could call Australia through an operator………. Just as I thought that I was walkingthrough customs and a window to the crowd waiting below and my aunt Menka saw me, instantly recognised me (as she said I looked like my dad who she grew up with as a brother) and next to her was my uncle Vangeli, my gorgeous cousin Susie and Nick who seemed so tall and planned all these crazy adventures for ‘the Aussie’. I was so relieved. I also got to meet my wonderful Aunty Souli and Uncle Jim – their kids Cyndi and Gabriel were were little at the time but I felt I got to see them grow. It was so much fun to spend lots of time together and especially loved going to watch them play ice hockey. I had such a brilliant two weeks with my lovely relatives that I vowed to return. And that I did – this is my 10th trip back to Toronto. I came back for their weddings. We kept in contact through letters – I missed a lot of the growing years of their kids though I felt I shared some of it through Facebook. I’m so glad I’m back now after 15 years so that they can meet my family and renew our strong and growing bond. What a fantastic time we had. My uncle and aunt were so nice to us, so hospitable, we felt really nurtured. While I was driving around on the last day with my uncle Vangeli he said ‘I’m really going to miss these kids – I love feeding them.’ He would come back each morning from the shops with delicious fruits, veggies, and of course – Ice cream! How could I say no when he came down with ice creams at 9.30 in the morning. The kids just loved it. We all loved our time there. Thanks so so so much. What I love about Europe is that it’s a very big place but in such small distances there is a big change in culture, language, diet – it’s so exciting and I love that! 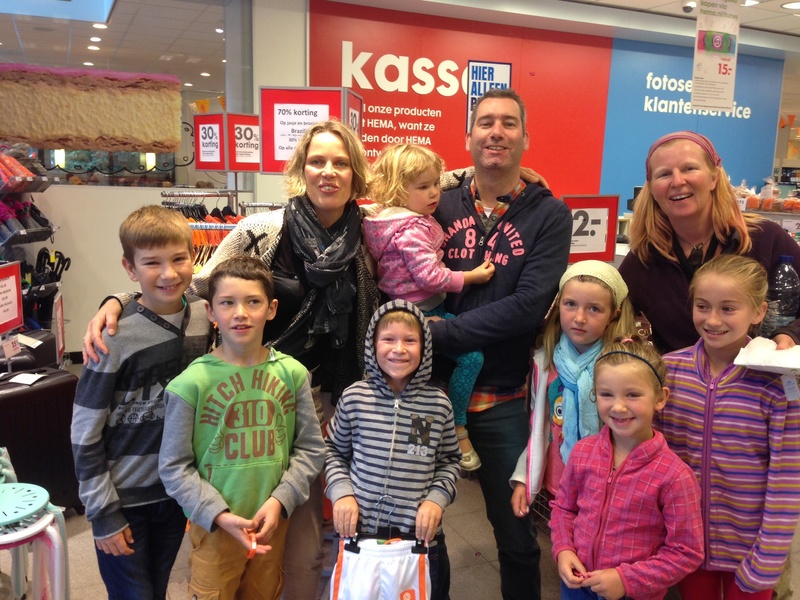 It had been about 20 years since I saw my Belgian cousins. They are obviously cousins from Greece whose parents migrated to Belgium many years ago. Twenty years is such a long time especially when some of my cousins were 15, or even under 5 years old at the time. 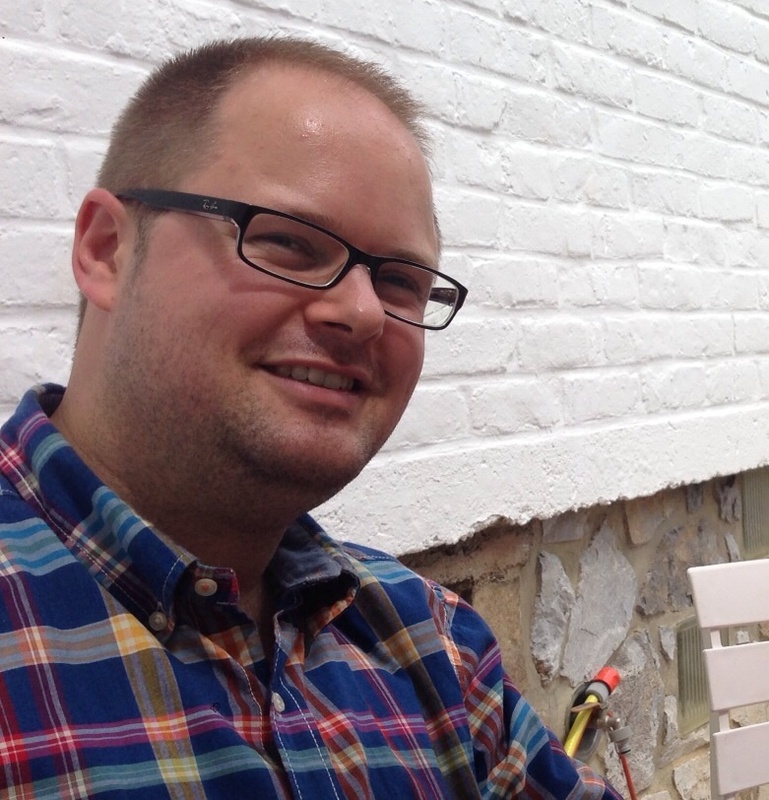 However over the last few years I have felt that I have enjoyed connecting with their lives and their paths through Facebook – there are many negatives and drawbacks to Facebook though I love the beauty of connecting with my family and friends overseas. 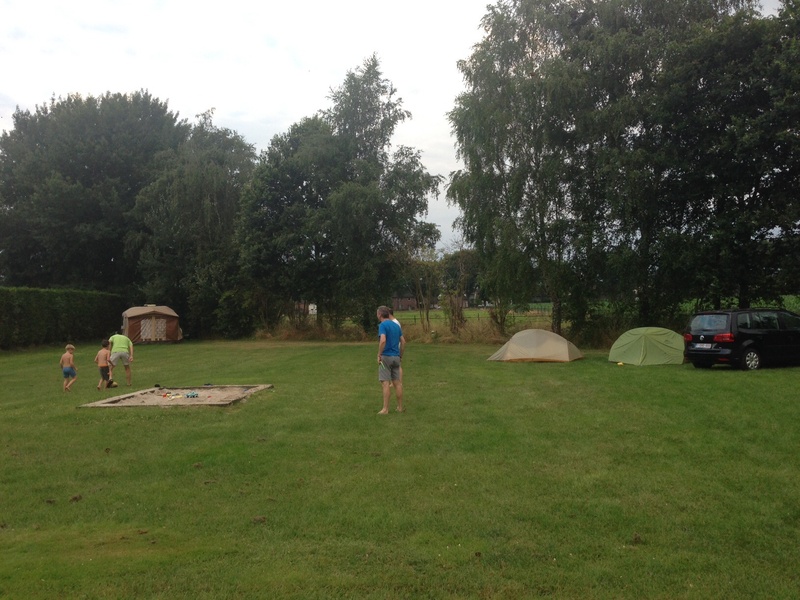 Anyway – when we were camping in Holland I couldn’t pass up the chance to see my cousins and aunt and uncle again – and it took us less than an hour and a half to get there – yes! Another country. Back in Australia it takes us that long to go shopping in Albury! Anyway it was quite interesting when we got to Verviers I stupidly pressed a wrong button on my iPad and lost our directions on the map app that sometimes follows us on our drive even when we are offline. So then we had no idea where to go – we stopped in the central area and I walked past a cafe and stood outside Mcdonalds to get onto wifi (at least they’re good for something!) and reboot our directions. Well I wish I had gone into that cafe because as I found out later on in the day – it was my cousin George’s cafe – we went there for lunch. Very freaky serendipitous moment that I didn’t take cause I knew I could get free quick wifi a few doors down. Small world! Anyway – our cousin Chris had just been to Australia a couple of months ago to visit his gorgeous sister Alexandra who is on a working holiday – at the time most of my family was out of Australia which was shame. First time I met him he was a few years old. 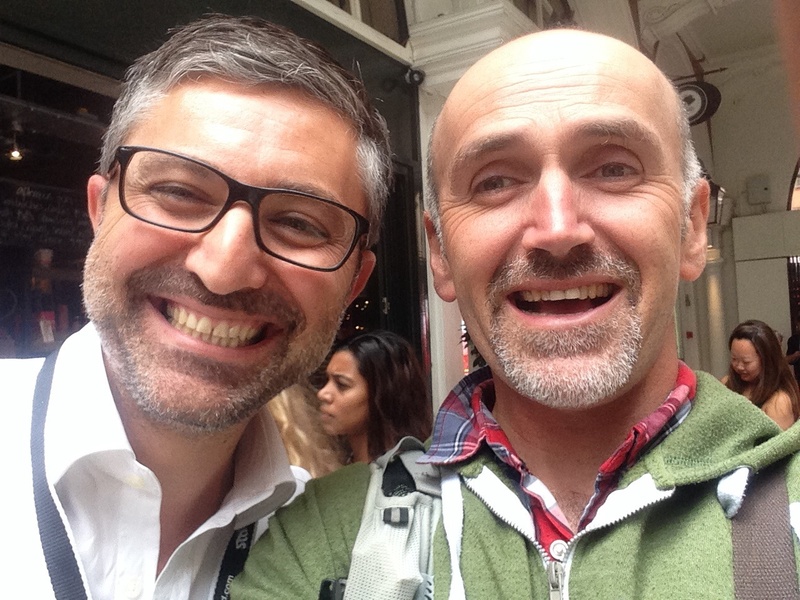 So good to see him – he was very jovial despite Belgium losing in the World Cup the night before! We all met at my other cousin Anna’s house who was 15 last time I saw her and it really warmed my heart to see her so happily married to Morad and with a beautiful young son Adam – and just moved into a great new house. I love being able to visualize them all in their Belgian lives now that I’ve seen it and felt it. My other cousins George and wife Fani and aunt and uncle were working in their cafe so we went there for lunch and boy was it a feast. I thought I wouldn’t be able to eat for days after. Very yummy. 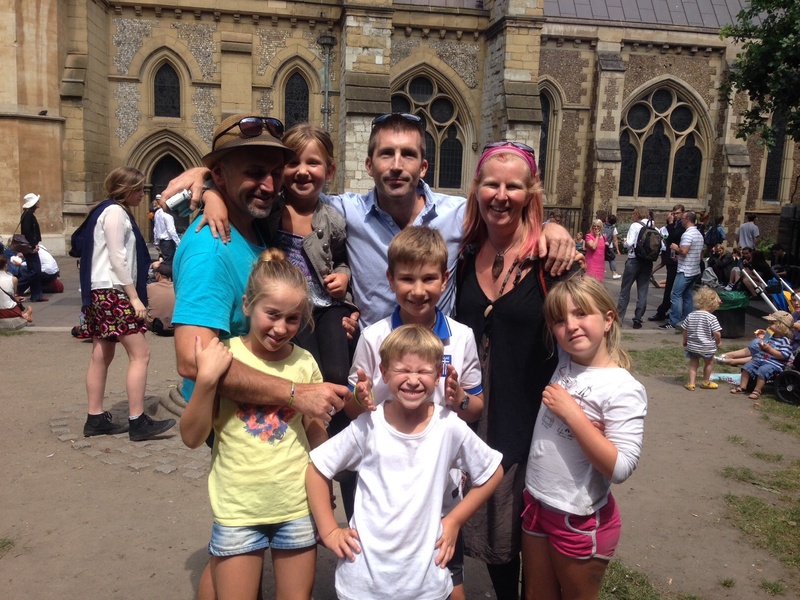 My cousin George who is my age and who I spent some great ‘young time’ with now has kids and his youngest son is Theo who is similar age to our older kids – great for them to connect and who knows maybe they will connect again independently and have their own relationship and memories. I hope so! 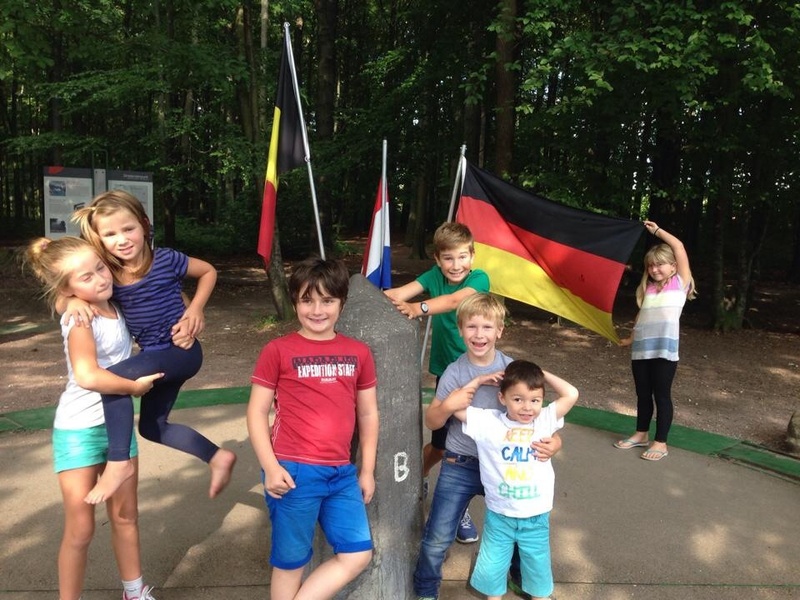 At the end of our day it was lovely to all go together to the point where Germany, Holland and Belgium meet. 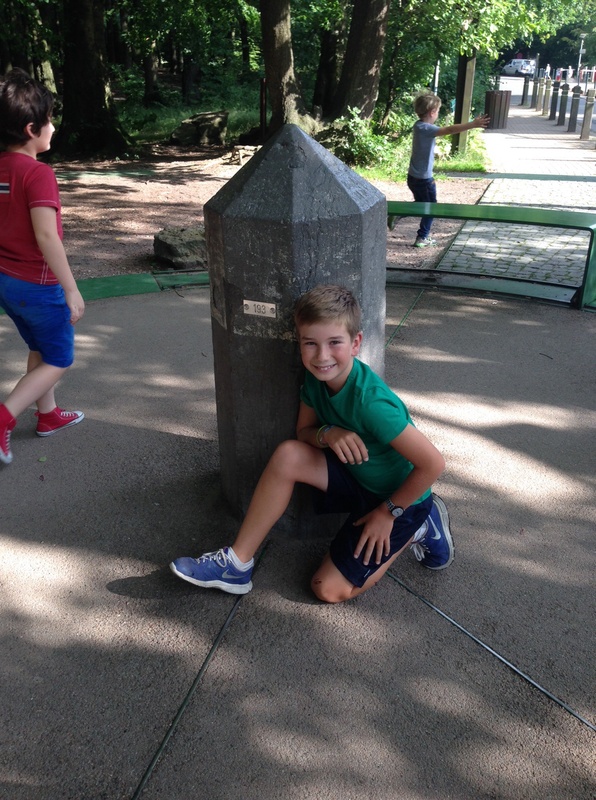 The kids got a real kick out of being in three countries at once. 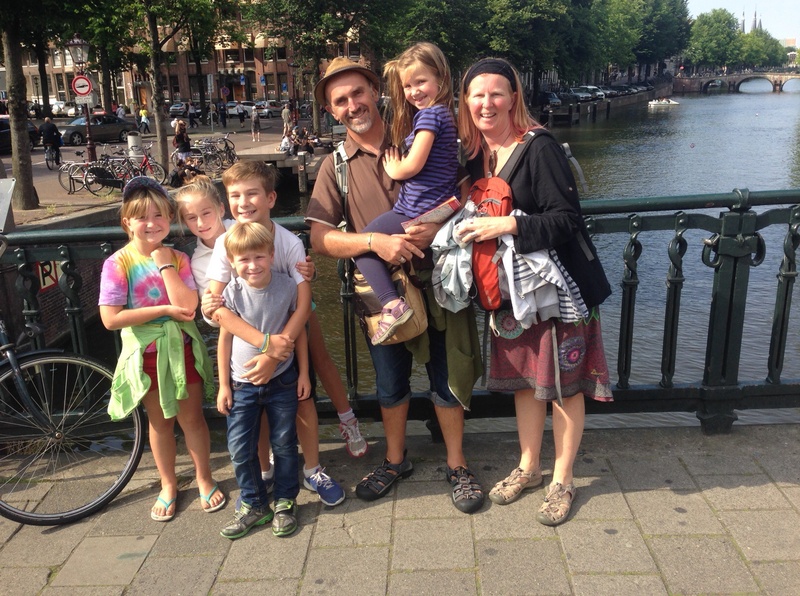 When we found out our wonderful Dutch friends – (Werner & Corina with their lovely kids Finn & Luna) from our Australian home in the King valley were coming back to Holland for a summer break, we just simply had to try and plan Holland into our trip and camp with them for 6 days. It was so wonderful to reconnect with them and for our kids to play so well. 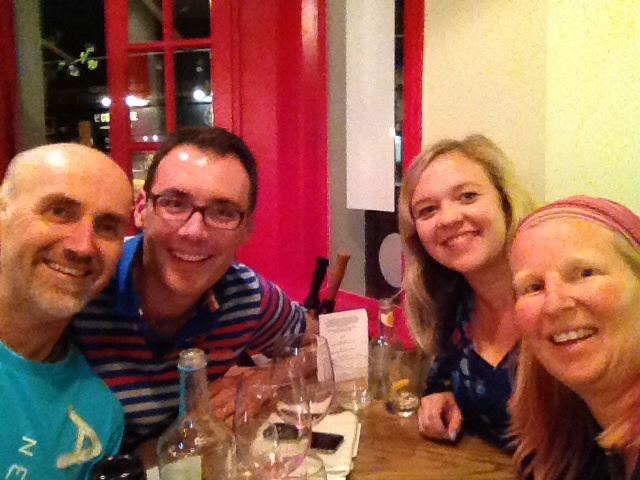 As we’ve said before – it’s always the people that make the place! It was also amazing to meet their families and friends and spend time with them. 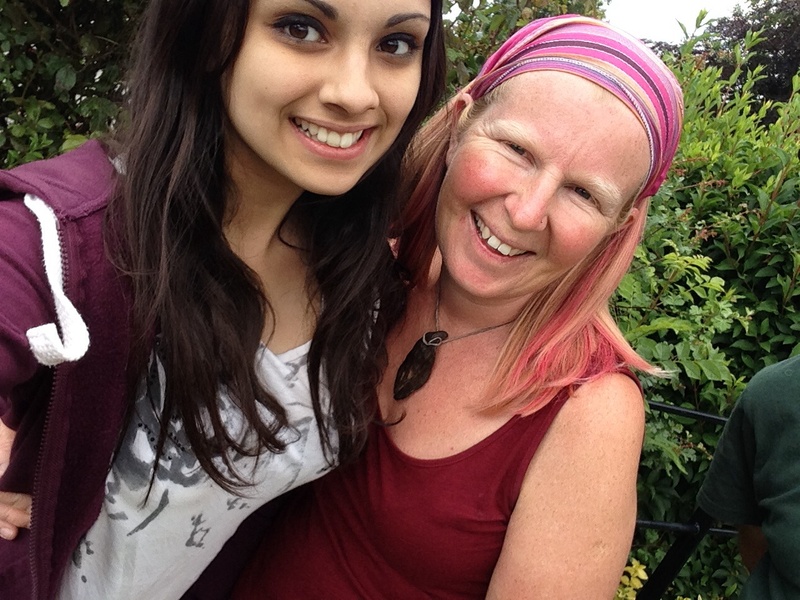 We had met Corina’s parents before in Australia and have had some lovely times together. I always love to visit a friends place of origin and to see and feel the place were their stories of growing up were formed. It was very special. 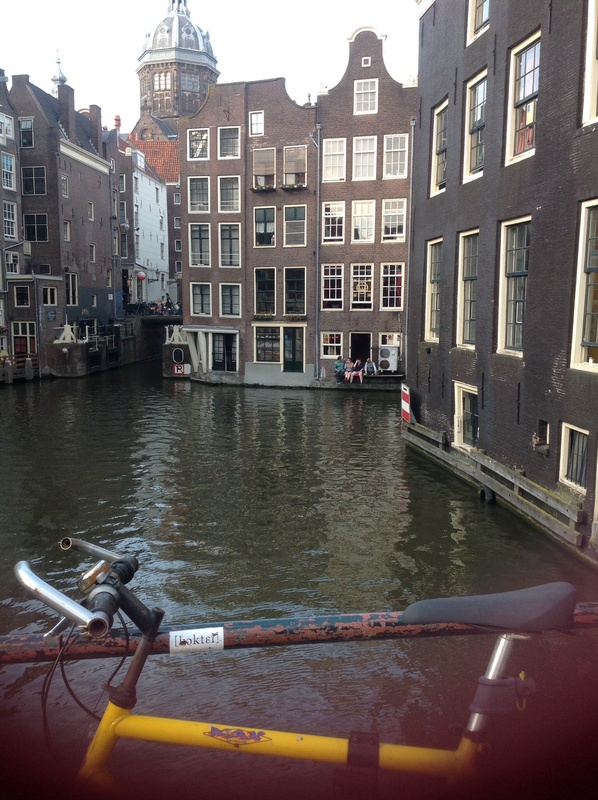 We didn’t necessarily come to Holland to sightsee but we loved the countryside – so green and pretty. However we were so grateful that Werner’s dad managed to find us some cheap family ticket to get to Amsterdam on the train. What a superbly beautiful city. 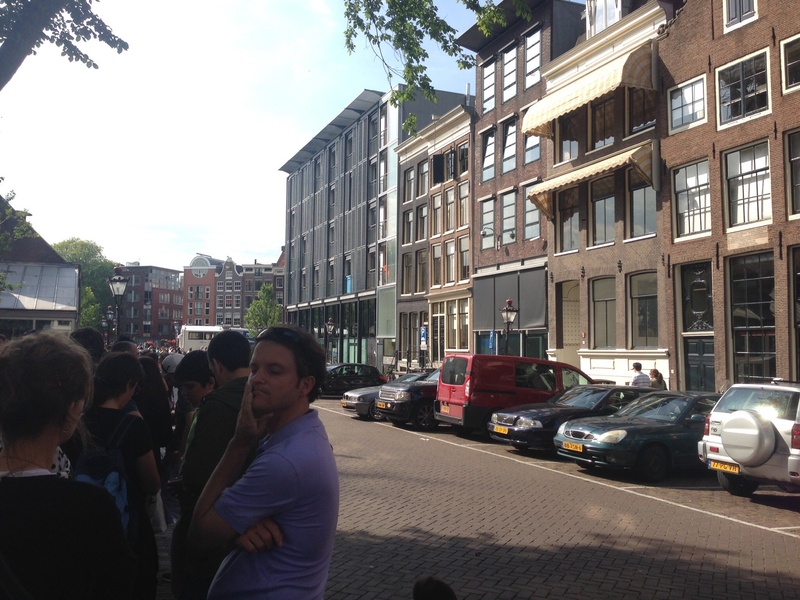 We normally don’t do queues and try to avoid touristy attractions or rather get to a place early but when we got to the Anne Frank museum we weren’t early – and we hadn’t had the insight to book tickets on the Internet to avoid some of the queue -so we just did it – I stood in the queue for over an hour while Sandy and the kids followed me from park bench to park bench and continued to read the fascinating story of this courageous young girl. 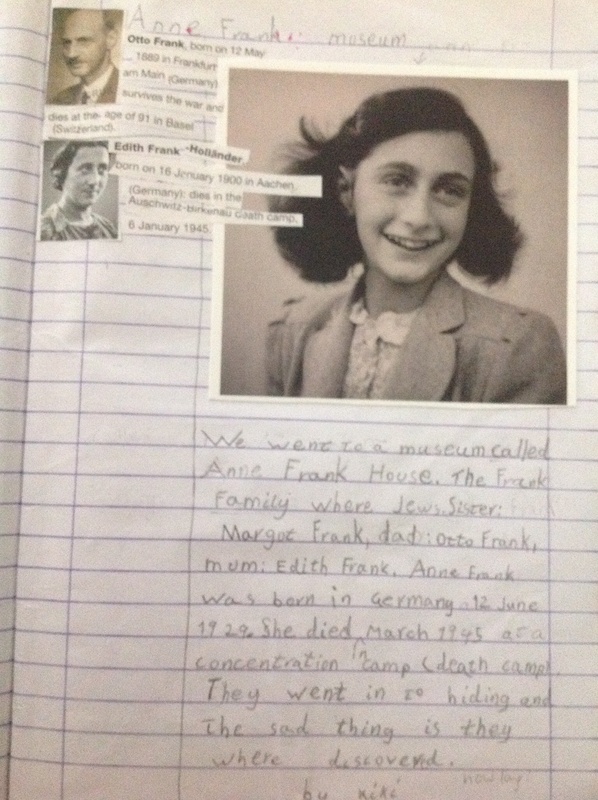 It was wonderful to visit and read her story and see where they all hid for almost two years – though war, being Jewish or any other religion, being persecuted etc are such difficult concepts for me to contemplate let alone the young minds of our kids that feel things so deeply. We are so fortunate to not live in a war zone where history seems to repeat and repeat. 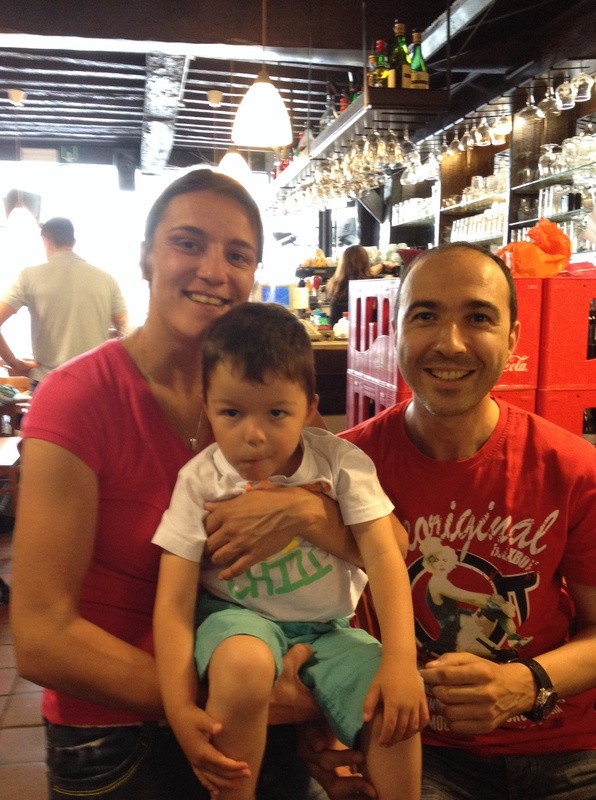 One of the highlights of our Dutch holiday was also catching up with my lovely ex Bowen student Femmy and her partner Mark and two lovely boys. It seems there are so many lakes around Holland where people love to go on holidays or just visit for the day and have fun in the water. 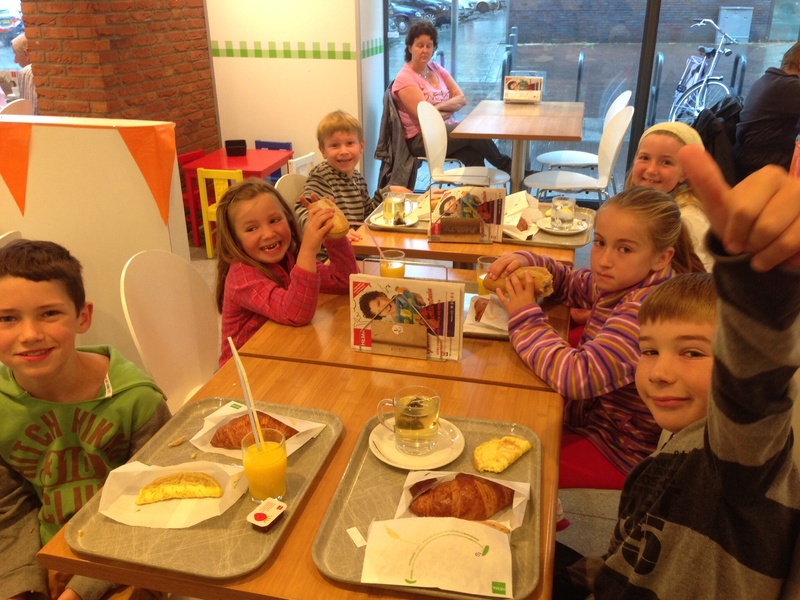 We had a lovely morning together with some very gourmet food. Thanks very much. It also made me ponder about how wide our global Bowen family is. Very special indeed. 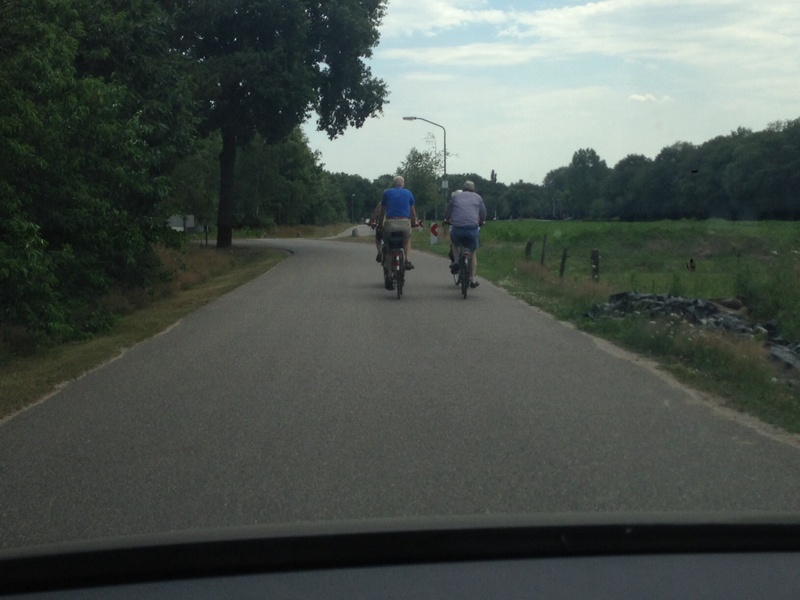 Lastly – something I just love about Holland is that bicycles rule the road! And on small streets they don’t necessarily move over so the cars can pass. They are more important than the car! I must say that I loved that! 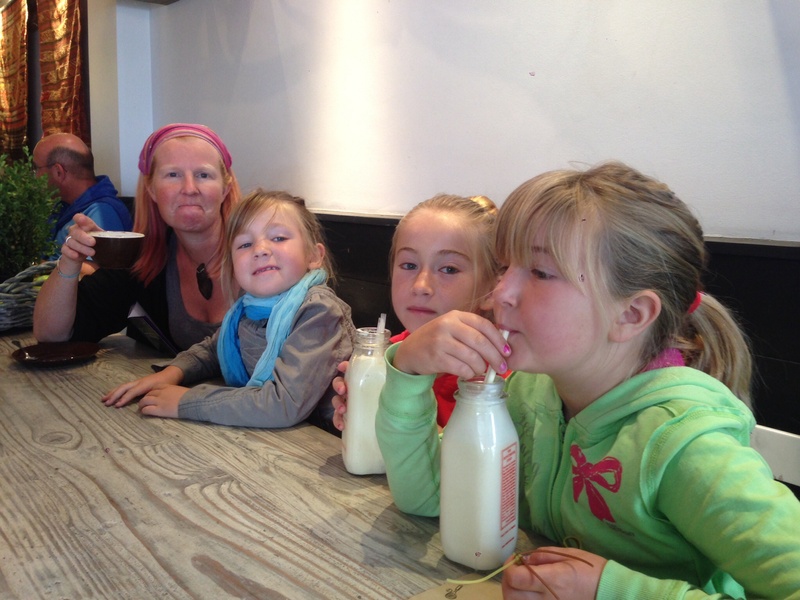 In Holland we went to a pancake shop where they sell cheese or cheese and garlic or sugar pancakes. We also went to a water park place that had two slides and a river that goes round and around. At Luna and Finn’s place there were also go carts. It was so much fun. Werner and Corinna are fabulous. They are friendly, fun and incredibly nice. They took us to see lots of amazing places in Holland like an amazing lake that had water so clear it was clearer than most beaches. Another place was an epic indoor pool that had water slides and was really fun. The first night they took us to a traditional pancake Restraunt and we had garlic and cheese pancakes and sugar pancakes and cheese pancakes – they were terrific. 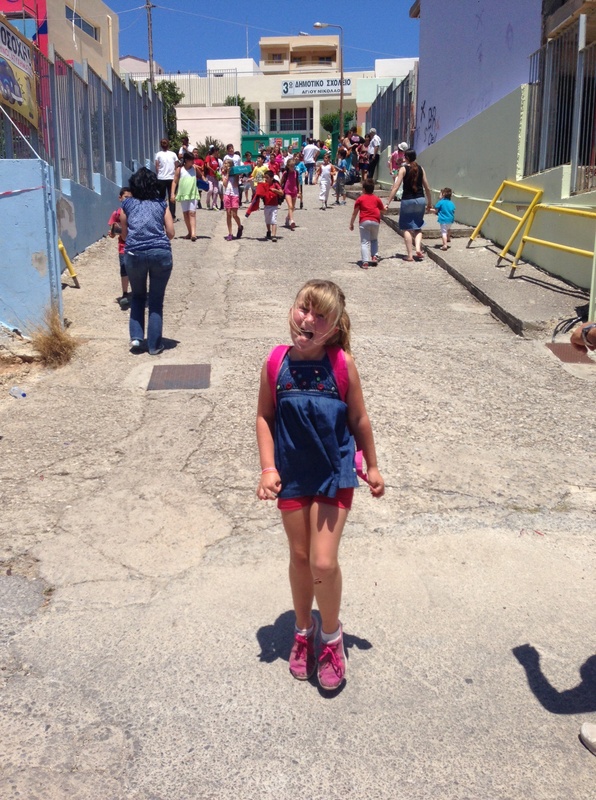 I was very proud of myself for finishing school in Greece because going to school was very hard. Greek is one of the hardest languages in the world. At the beginning it was weird not knowing what to do and I was so shy at the beginning. The good part of it is that I learnt lots of Greek and when I finished school last week I felt like I learnt a lot but not sure how much. Today when I was getting the bus tickets the man asked something and mum didn’t really understand what he was saying cause he was talking so fast and I answered him easily. It felt pretty good. 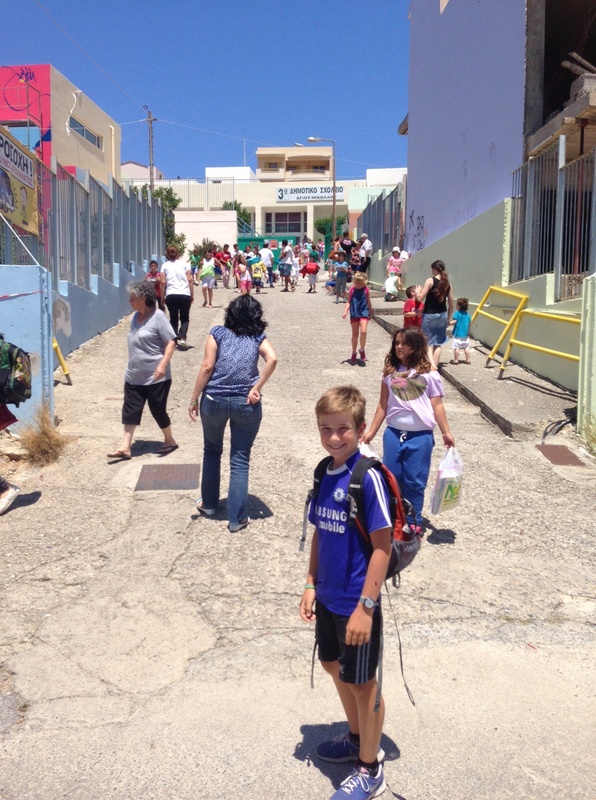 I enjoyed my Greek lessons – the ones that were my favourites were the ones that we played games but also learnt. I also liked when we had to bring in photos to talk about them. Kristalenia was our private Greek teacher 3 times per week for about 1.5hours until we decided to do more separate classes so Yasi had 45 mins and Kalika and I had 45 mins. 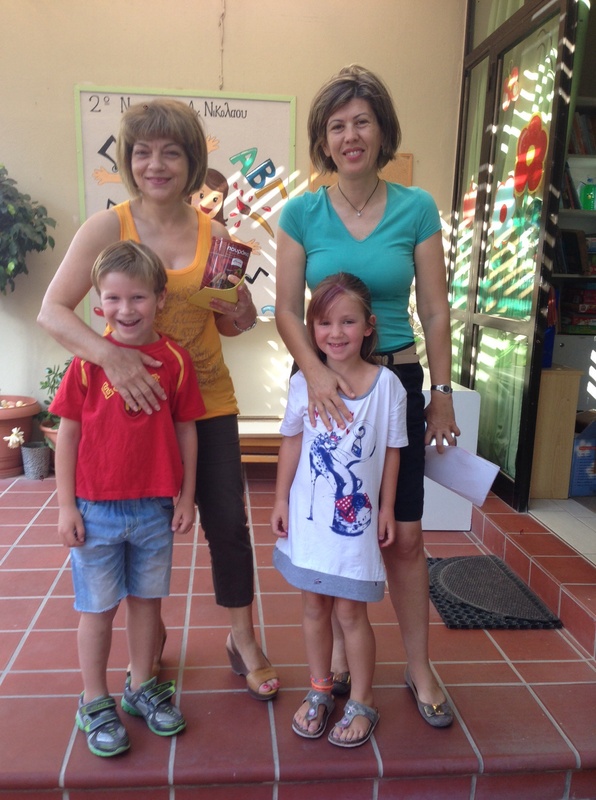 We learnt heaps with Kristalenia – she was very patient and made learning finally nd gave us a good amount of homework. She also became our good friend and we met up with her lots. Her children, Gianni and Dimitri were also very nice. 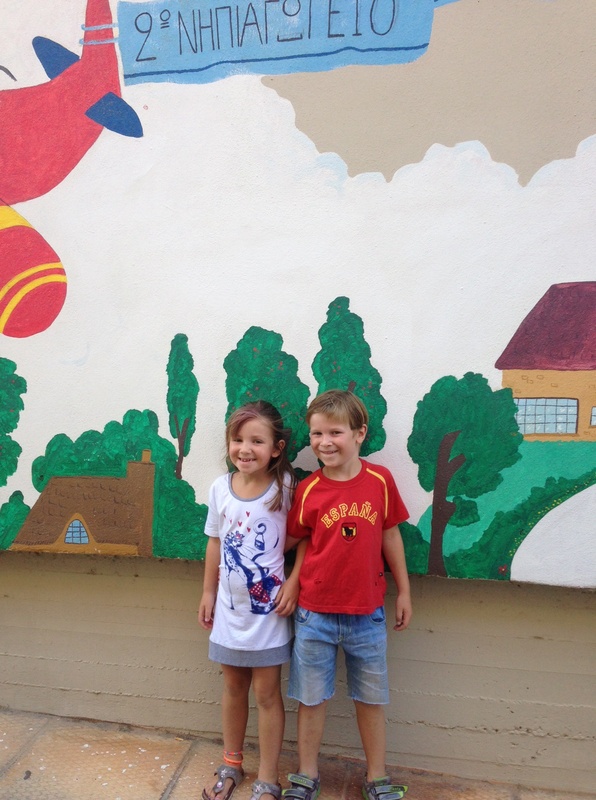 On the last day of school we did a concert – we had to dress up in Greek colours – blue and white. I also was in a group where we had to wear blue scarves – Zoi was in the yellow scarf group. I sang four songs with my group and said a poem which is lots of Greek words on my own – my teacher helped me a tiny bit with the words. I loved it because all my friends were there and my baba and mama and brother and sisters came and even our friend Manoli came. I really liked the concert cause we had to dress up in blue and white and my scarf was yellow – that is kitrino in Greek. I really liked singing with the other kids. I liked seeing baba and mama clapping in the audience. My teacher was Kiria Leftheria and she was really nice to me cause I do my work very neat and sometimes I get it wrong but lots of times I get it right. She gave me a pretty box to take home with all the pictures and work I have done all year. 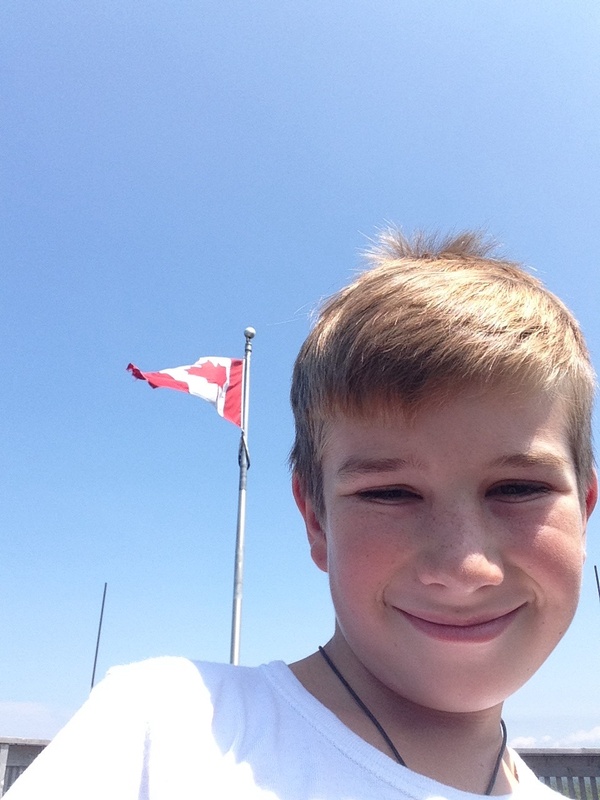 I am very happy with myself for what I’ve achieved at school in Crete with one of the hardest languages in the world. School was really hard but I did it and time flew like a butterfly. What I found difficult was understanding all the maths they did in year 4 was work they do in high school in Australia. The instructions in Greek were hard to understand and the teacher would often go off her head at some of the kids when they were playing up. She only gave them one chance and then they had to go to the office. She was nice to Toby and me but I was still really scared of her. 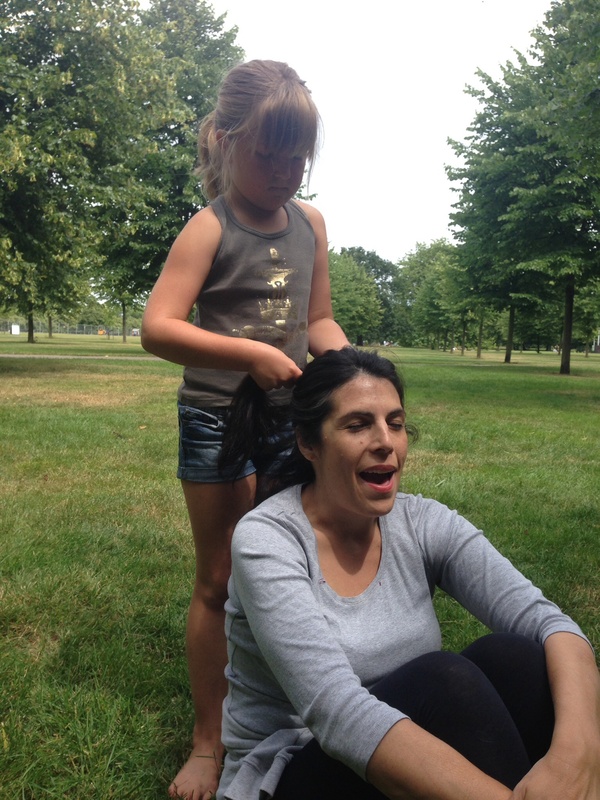 At the breaks I loved playing with one of my best friends called Isabella. She’s half English and lives in Crete forever. Every day I picked up words from school and then I would ask people what they meant and that really helped my Greek. 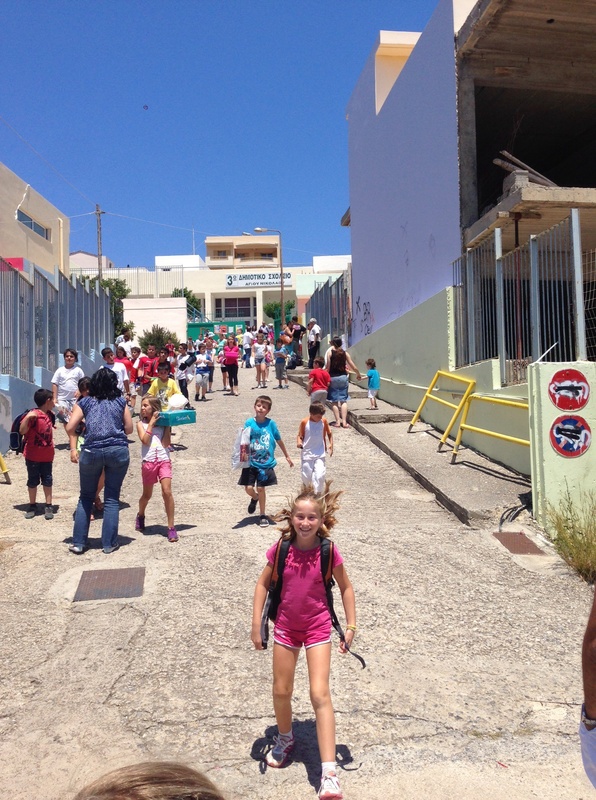 I learnt lots of the history of Greece in school – it was one of the subjects I liked and understood. I will try to keep going with my Greek and try my hardest. When we start home schooling again in a few weeks one of the subjects we have to do for an hour every morning is Greek. The other subject is maths and also reading and writing in English. School was very hard in Greece because at the beginning we hardly knew any Greek and almost everything they said I couldn’t understand. Now it’s much better and I understand lots and I am Miss corrector beacuse I even correct my grandma who is from Greece and my baba who was born in Greece. I had a teacher that was nice and I had lots of homework most days and sometimes I couldn’t get it all done. But it made my Greek very good now. I understand most things in Greek. Kiria Soula was good because she actually told me what I had to do when I didn’t understand and she made sure I understood everything. Before Christmas she sent me to do language with the grade ones but then I had caught up to my class in grade 2 so I came back for all classes with Kiria Soula in 2B. I was proud of myself for finishing and time really flew like a bird in the sky. It was a pretty good year for me. 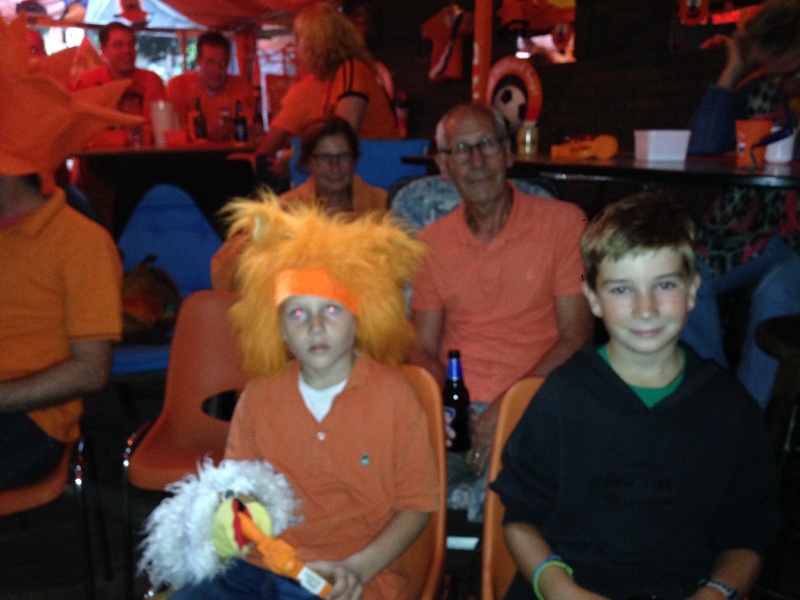 Tonight on the 6/7/14 Werner took my baba and I to one of his family friends’ house to watch Holland vs Costa Rica in the World Cup Quarter Finals. When I walked in there I thought ‘WOW! 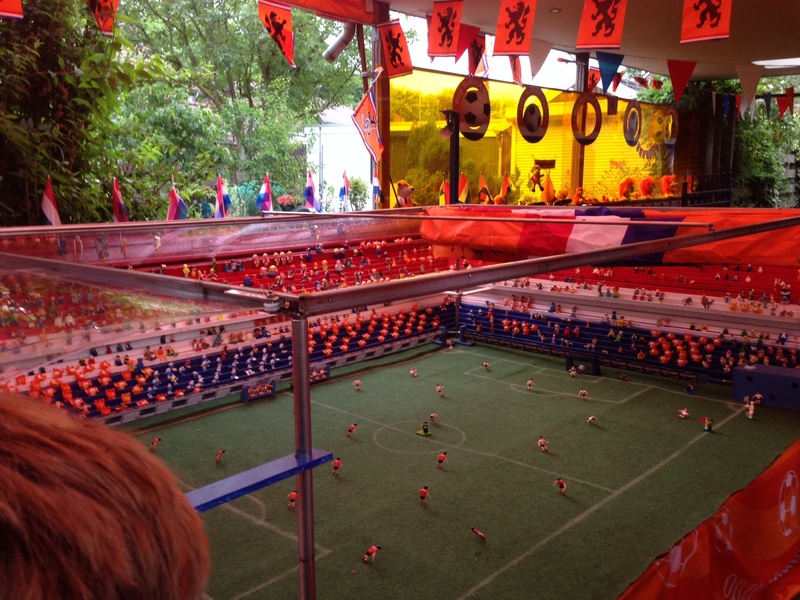 These guys are big fans!’ What I first saw was an amazing big Lego modelled soccer pitch. There were Corner flags, little Lego men with cameras for TV and cameramen for the papers. It had flag men and all of that. There was even a crowd of little Lego people and little Smurfs. That soccer pitch was in the front yard and covered the whole of the driveway. 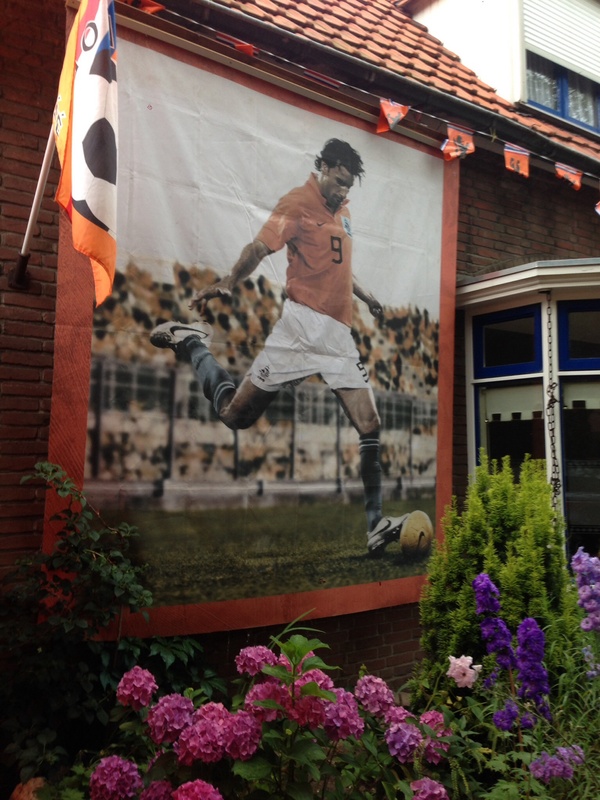 On the front wall of the house was a humongous banner of a soccer player and lots of flags. 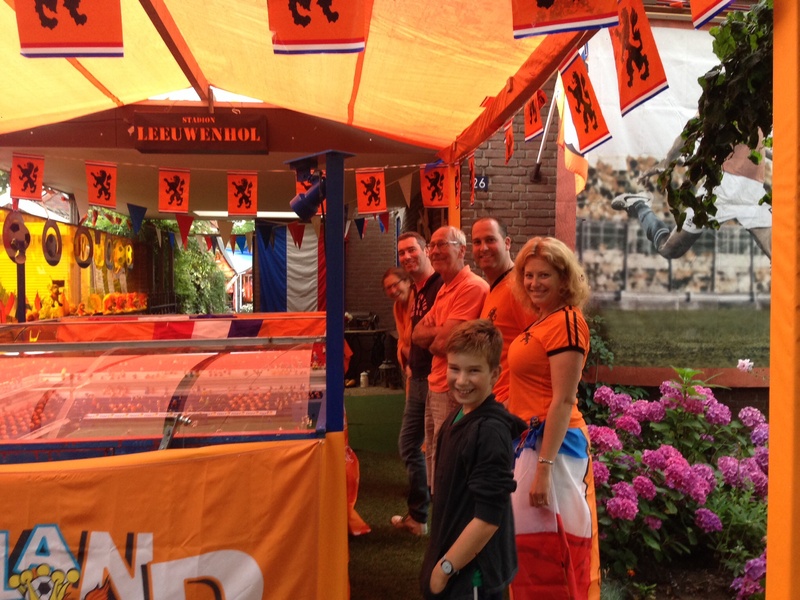 They had also attached a Netherlands flag like a roof for the soccer field and it opened and closed mechanically. It was really cool. At the back of the house there was a big outdoor covered area that was completely orange. In the front of this area there was a wall and a camera projector that you connect to a computer to make it a big screen – underneath it there was a table with so many orange football souvenirs. There were even orange coloured nuts and orange chips to eat. There were lots of seats and bar stools and I thought there wouldn’t be many people but then they started coming and I think there were about 30-40 people. 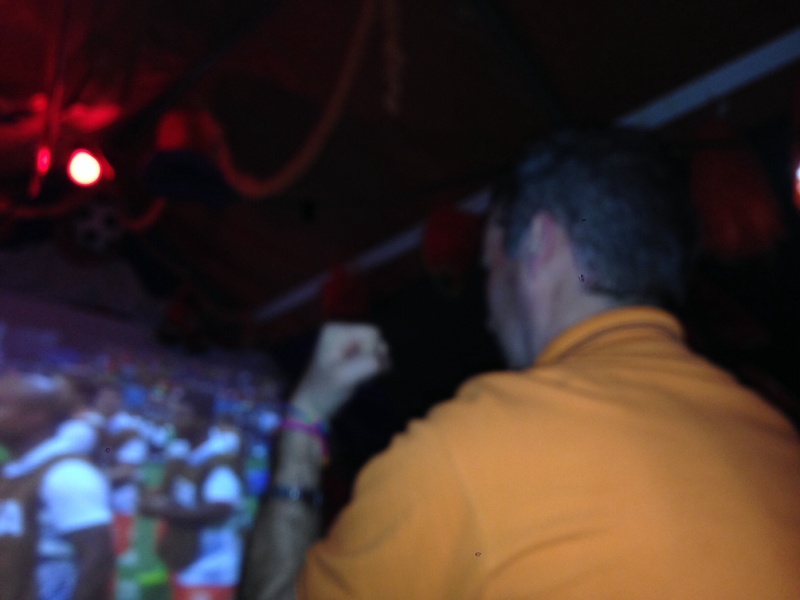 The game was very exciting – it was quite amusing when there was absolute silence and everyone had their eyes glued to the screen but when there was a good pass down to the front they would all start shouting “Hup holland Hup” and jump off their seats. It was a tense game – most adults had at least 4 – 5 bottles of beers. 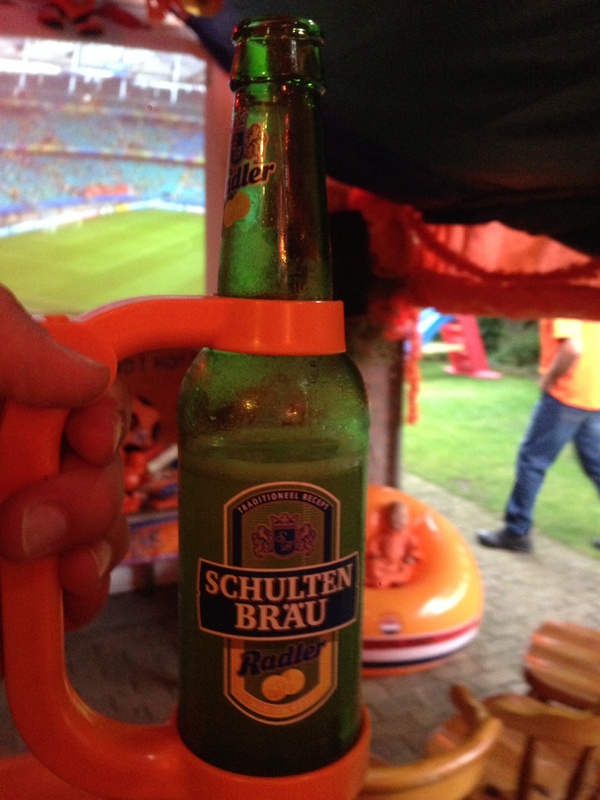 They even had orange bottle holders with whistles to blow when they got a goal. The score was 0-0. They went into extra time and it was still 0-0 so they had to go to penalties. I found it quite funny and amusing that they changed the goal keeper before the penalties. I read in the paper that the goal keeper that was substituted off was angry cause he wanted to keep going. I thought it was right to change the goal keeper cause the one they substituted on was very good at saving penalties. 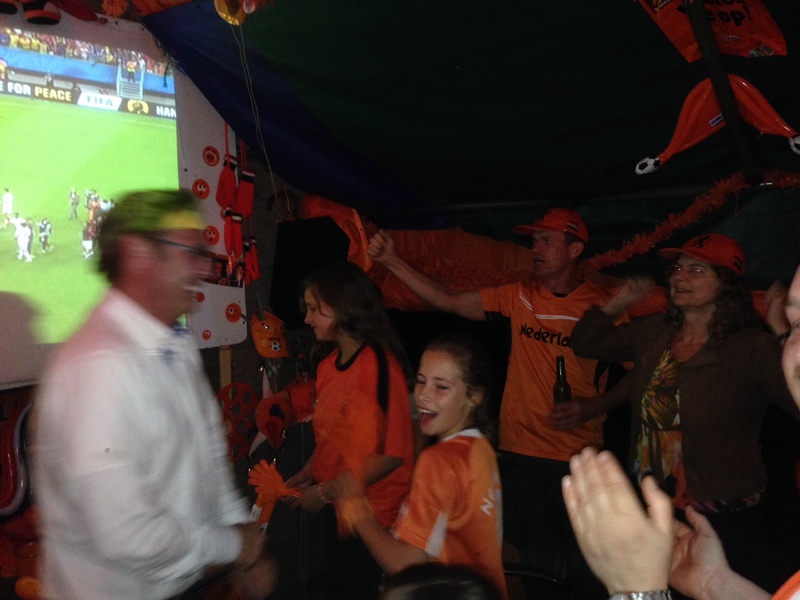 Holland aren’t usually good at penalties. The goal keeper was very amazing – he made two saves and the other goals he was inches away from making the save. One person said that she didn’t really like the coach because of his attitude but he’s a good coach and guided Holland very well indeed. Most people really really respect his decisions and think that he knows what he’s doing. 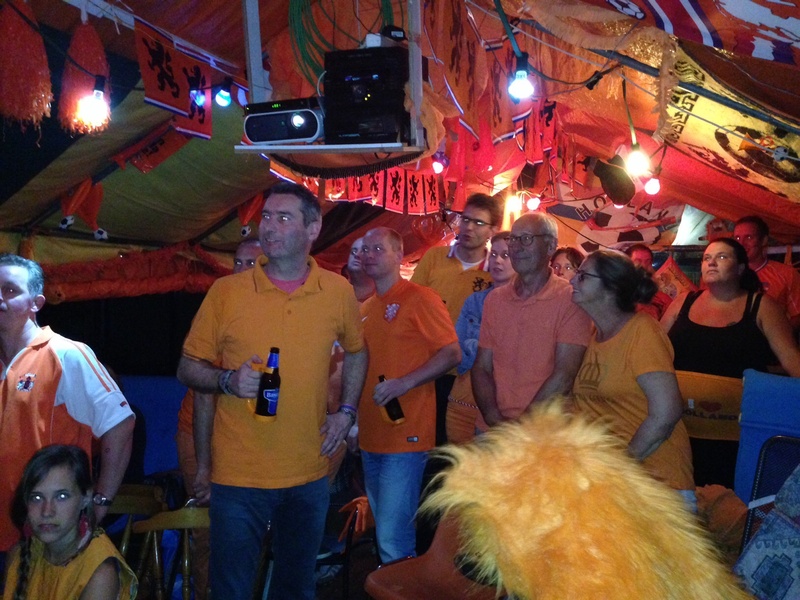 The penalty scores were 4-3 and Holland won. Everyone was going absolutely crazy when they won. Someone even snuck into the garden and lit some fireworks. Like everyone else I actually drank quite a bit too – but I didn’t drink alcohol. I was quite surprised that baba let me have a few cups of Fanta because it was orange. I also had one cup of orange juice. It was a very very late night – we went home at 1.15am. 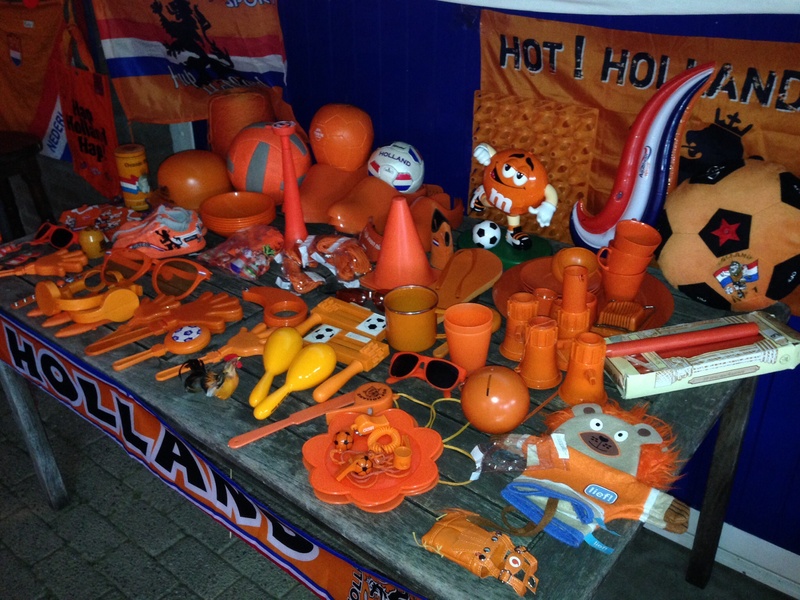 At a shop earlier in the day we bought some orange sparkly hairspray and some kind of orange streamer spray so while it was the penalties when Holland got a goal or saved a goal I kept spraying and it was really really fun. I can imagine having some kind of party like that in Australia but not as big. I’ll be on a plane when Holland plays again on Wednesday and I’m not sure how we will find out the scores but we’ll try. 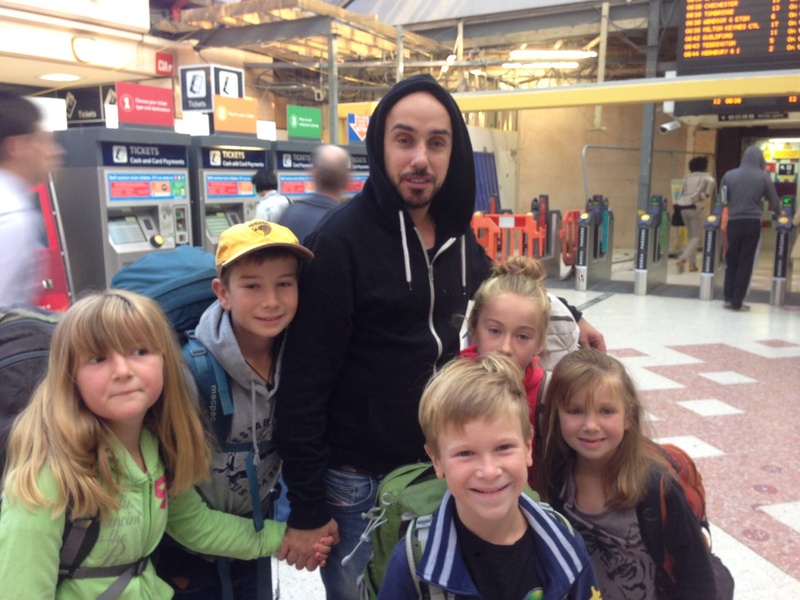 When we arrived in London we arrived with the underground train from Paris. 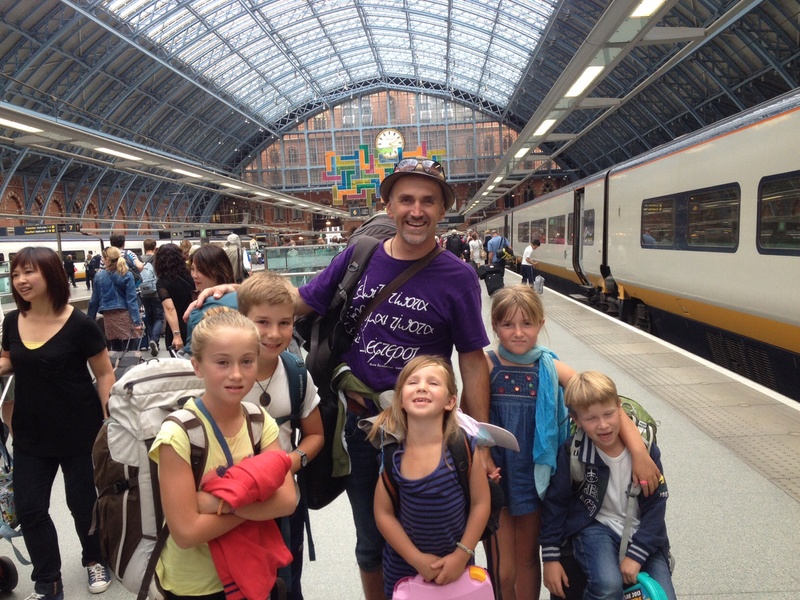 The London train station that we arrived in was very big and called Kings Cross – St. Pancras. We waited for about 30 minutes for Sally – she is my uncle George’s wife. So Sally picked us up from the train station and we went back to her share home. On Tuesday it was a bit rainy and we just stayed at the share home and there’s not much to tell you about our second day in London except that I went out with my baba for a few hours and we saw Big Ben, the London eye and the blue rooster in Trafalgar Square. We sat down in a cafe for a while and I had a strawberry milkshake. On Wednesday my uncle George had another day off work and we went to Buckingham palace where we saw the guards with their big puffy hats – I thought they couldn’t even see. 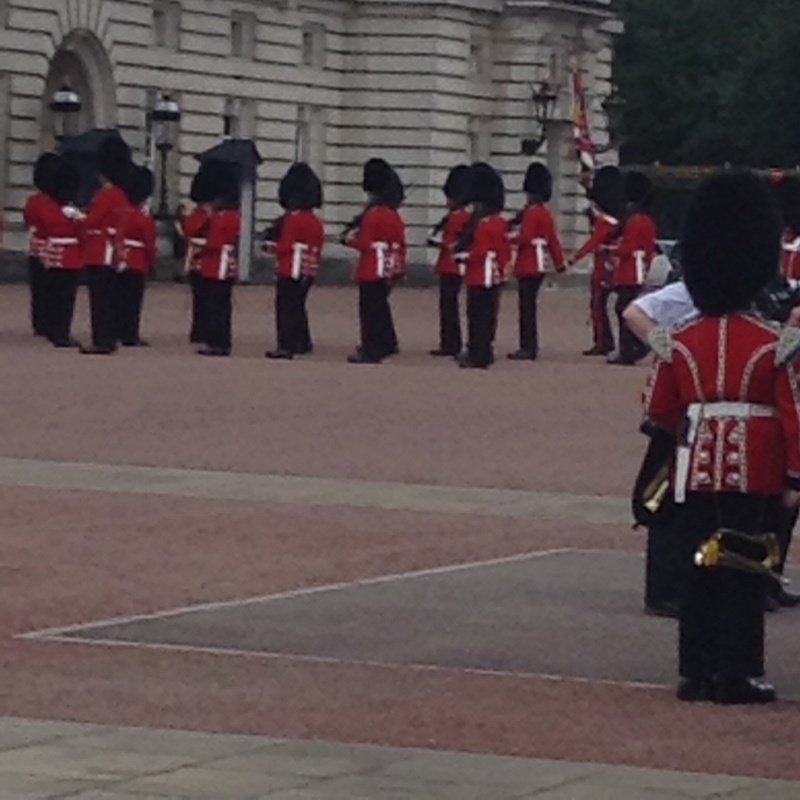 We also saw the Changing of the guards. After the palace we went to the Borough market to have lunch. I got a sausage. We also met my dad’s friend Steve. It felt great being able to speak English instead of Greek. 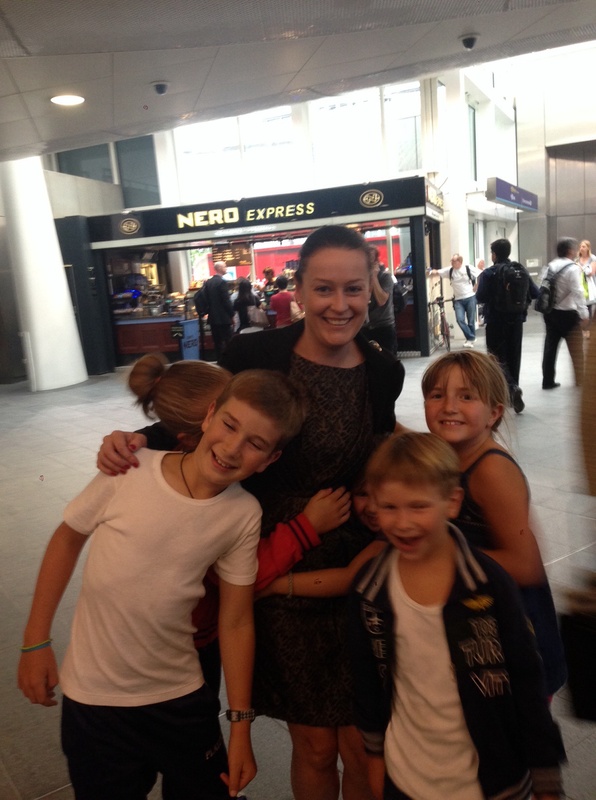 We met our aunty Sally at the Kings Cross train station. We went to her house and watched tennis because it was the first day at Wimbledon. We also played games and relaxed. That night we didn’t see our uncle Chich cause he was working late. Next morning Chich had a day off – when he woke up he made us his super cool pancakes. 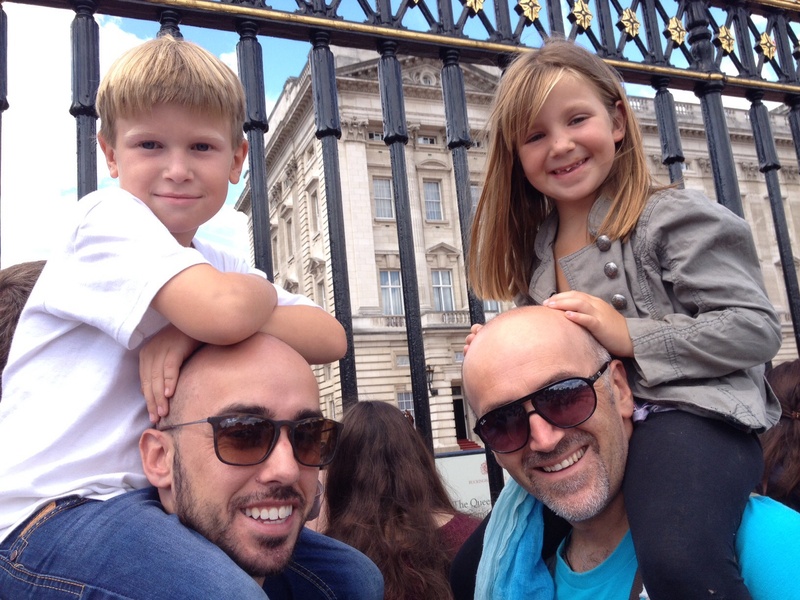 Staying with Chich and Sally was awesome because there was lots of things to see and do like the Changing of the guards at Buckingham palace. I think their fluffy hats look ridiculous. 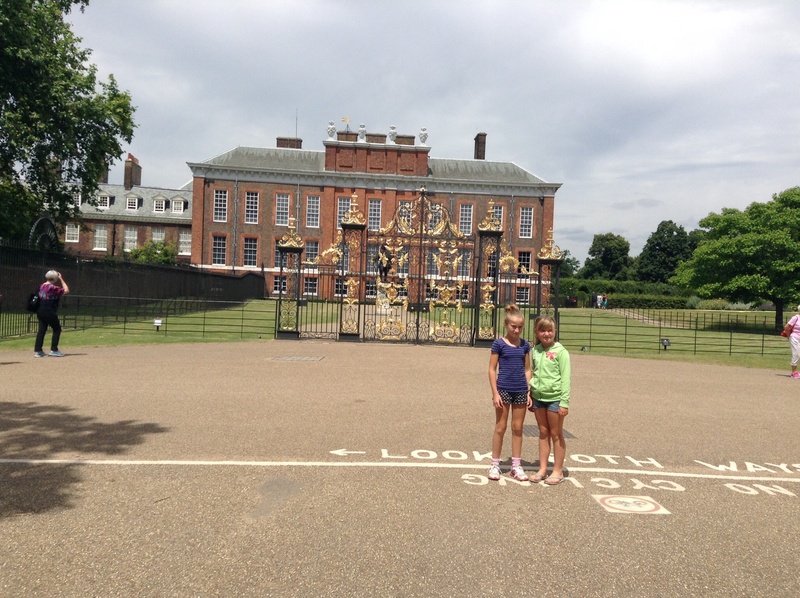 We went to the park right outside William, Kate and Prince George’s palace. There we met one of baba’s friends called Penny and her dog Toby. Penny is married to Alex who is my baba’s cousin. It was so fun playing with him. Toby is a Golden retriever. Sometimes when we were calling him our brother Toby thought we were calling him instead of doggy Toby. Before Toby flew to London he had to have all his checks by a vet and stuff like that. His owners – Penny & Alex moved to London from Melbourne for work. They couldn’t bear to leave poor Toby behind. He even has a doggy passport. We went to a market calked the Borough market and Chich got us the most awesomest meringues and lamingtons. We met one of baba’s friends called Steve (they went to university together in America) and I told him my name was meat pie cause I was eating a meat pie at the time. We went over to Oliver & Amy’s house for a pizza and movie night. They had a really nice house and we got to watch a movie called ‘Meatballs’ where they turn food into water. It was an awesome movie. Every night when Sally got home we all jumped on her and almost made her fall. She’s fun. 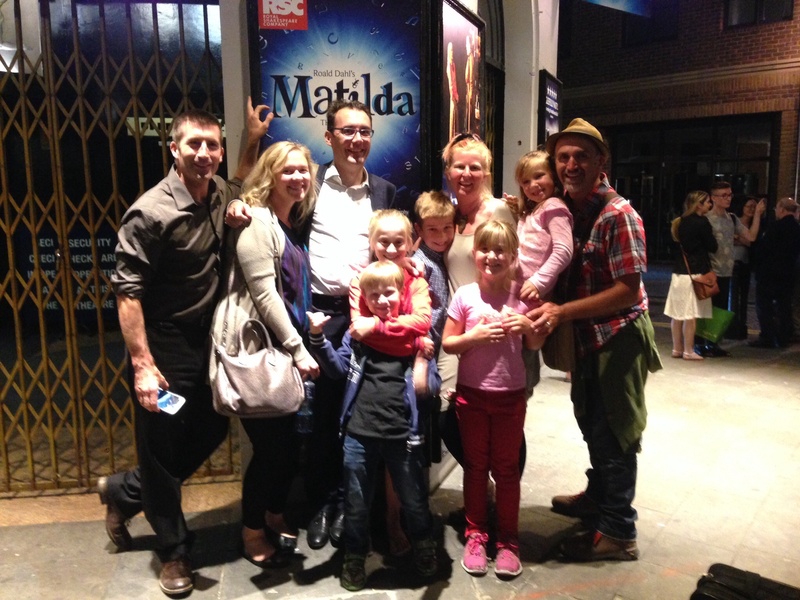 On the last night we went to the musical – Matilda. It was a bit different to the book but very very good. Miss Trunchball was actually played by a man. He was awesome but very scary. George and Sally are amazing – they are very loving and Chich was very nice to us even though he was very tired because in the last 48 hours before we arrived he had worked for 36 hours and only slept less that 12 hours in two days so that he could take 2 days off to be with us. His shop is in Wimbledon and it’s a very good shop and lots of people go there – even tennis players. Maria Sharapova and Grigor Dimitrov go there every day. Also one of the days Sam Stosur went and my baba saw Leyton Hewitt there. Martina Navratilova said that his cafe made the best scrambled eggs she had ever had. If you want to go to try them it’s called ‘Brew’ and is on 21 High street in Wimbledon village. When I went there I had an amazing vanilla milkshake and some pretty darn good pancakes. Sally is very very kind and nice. 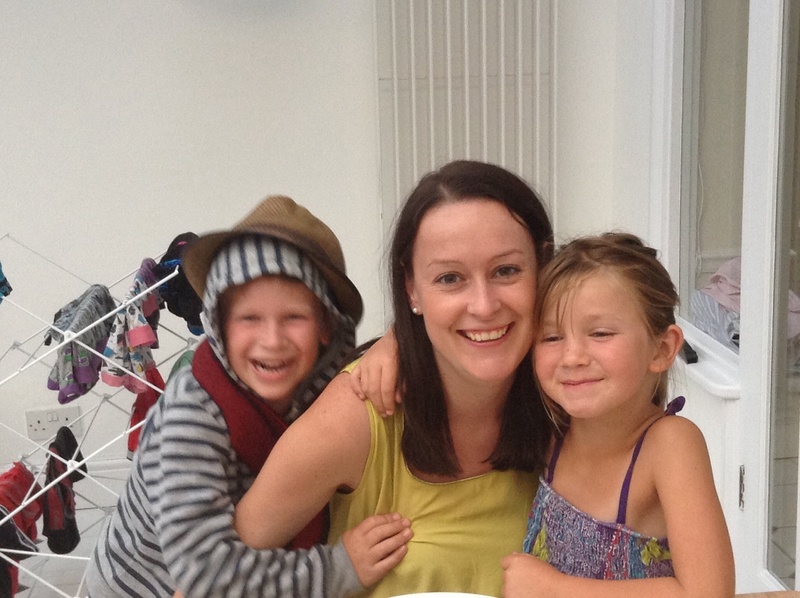 She picked us up from the train station and she is an amazing aunty. (Along with four other aunties that I’m very close to). Sally and Chich were also very kind to us – they had to look after us when my baba and mama went to the movies and then out for dinner with friends. First they took us to the market to have lunch and then took us home and we hung out and had dinner. They let us listen to music and dance around and watch movies. It was like our own little party. London is amazing. We saw the musical Matilda and it was excellent, even though I was very tired because I had gone to Wimbledon in the daytime. Kids that were Kalika’s age had bigger parts than most of the adults. I thought to myself – “how do they remember all those lines”? I think I liked Matilda the most – she was very funny at times and I loved the librarian. I liked it when Matilda was telling a story and the librarian said – “Hey Matilda this is such a sad story” and Matilda said “Do you want me to stop?” But the librarian said “Don’t you dare”. Miss Trunchball was a very funny character but I think it was a man playing Miss Trunchball. Oliver and Amy – our friends that we met through Grandma and Pa and also my baba’s friend that he met at university in America also came. His name is Steve and he’s quite funny cause he likes to joke and he’s a funny character. The musical is a bit different to the book but that happens in most musicals. London is a wonderful and interesting city because there are lots of famous monuments and places. Like the Queen’s palace, the blue rooster in Trafalgar Square and the borough market was fabulous. I had a terrific gourmet meat pie. Also they had very good brownies. We had lots of fun in London. 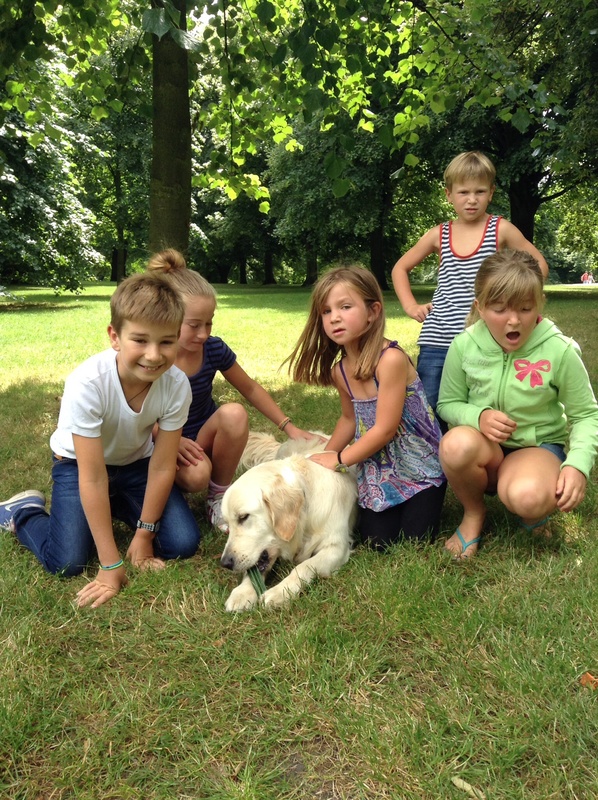 Bye Chich – we love you – thanks for all the treats! I met Jane, and later Krishna in India almost 20 years ago exactly. I had begun my love affair with India travelling initially with my uncle Bill (Darshan), and then following up research contacts I had developed whist writing a paper on India and indigenous medicine whist at uni. As things happen and connections are made it came to be that I met Jane who was working as a volunteer in Latur where an earthquake had occurred that had killed 10,000 people in early 1994. We bonded enormously as we fondly recall over baileys, toast and late night chats in the aid shelters provided by the agency we were both connected to. Jane then met Krishna through this work; both lawyers, activists and passionate people. Kiran was later conceived and tada! I was made a non religious fairy godmother! I visited them in India in Kirans first year of life, wiped her cute little bot and continued to discuss social change, politics and the like. 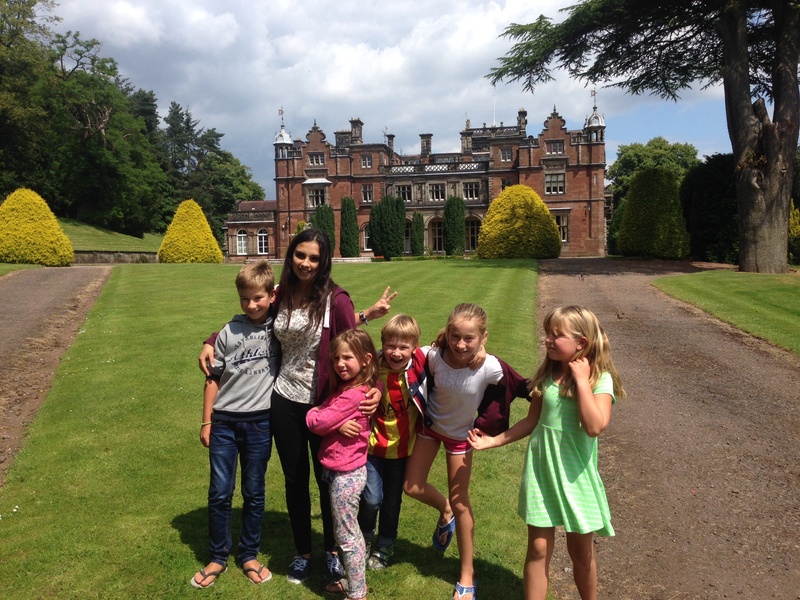 After many years in India (Krishna’s native land), Jane secured a job as a human rights law lecturer at Keele University in NW England and the family emigrated. 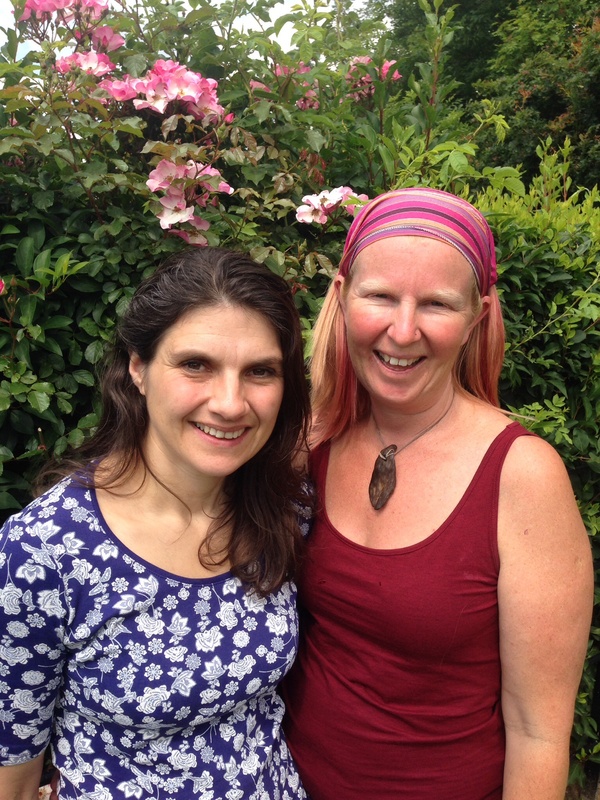 Both have made massive contributions to; increasing diversity and difference in the English police force, to domestic violence legal responses as well as facilitating many exchanges between hands on projects in human rights projects on the ground in England and India. 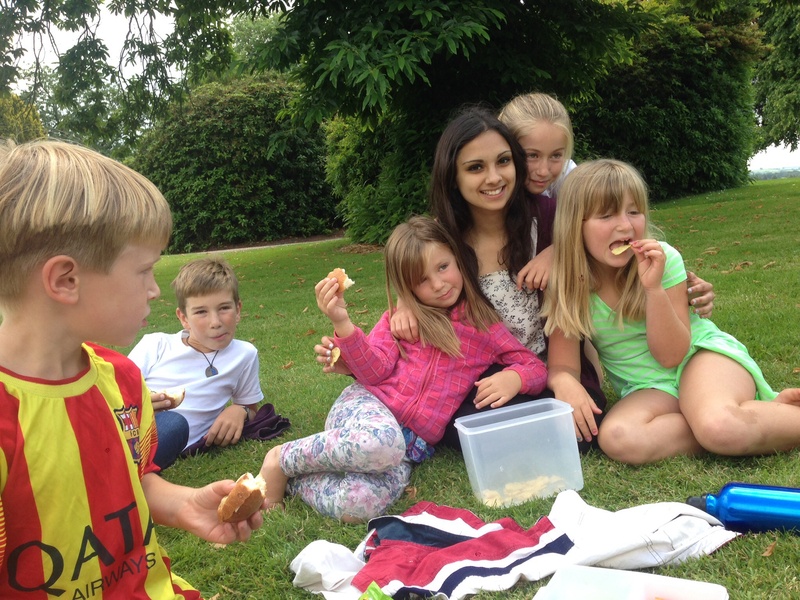 They are now the proud parents of the amazing Kiran, Rohini, Aditya and Sarika aged 16 down to 5 years…. It has been been such a pleasure and honour to meet these growing souls. It has been so special to reconnect with them. 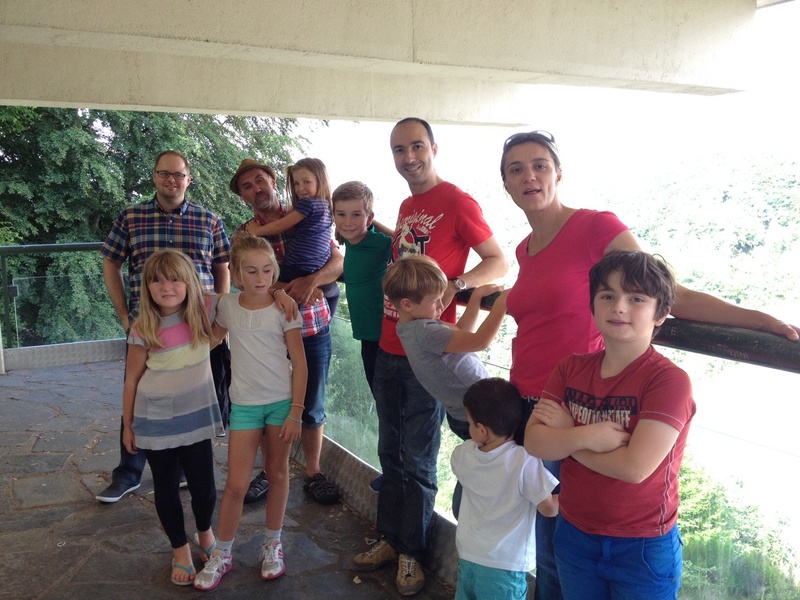 Yasi, Toby, Christos and I visited their smaller family almost 10 years ago. Our contact has been sporadic since, something I’m not so proud of, especially being Kiran’s godmum! However, the connections re-forged this time round have reaffirmed the beauty and depth of our mutual respect, the power of having love and acceptance in your heart. 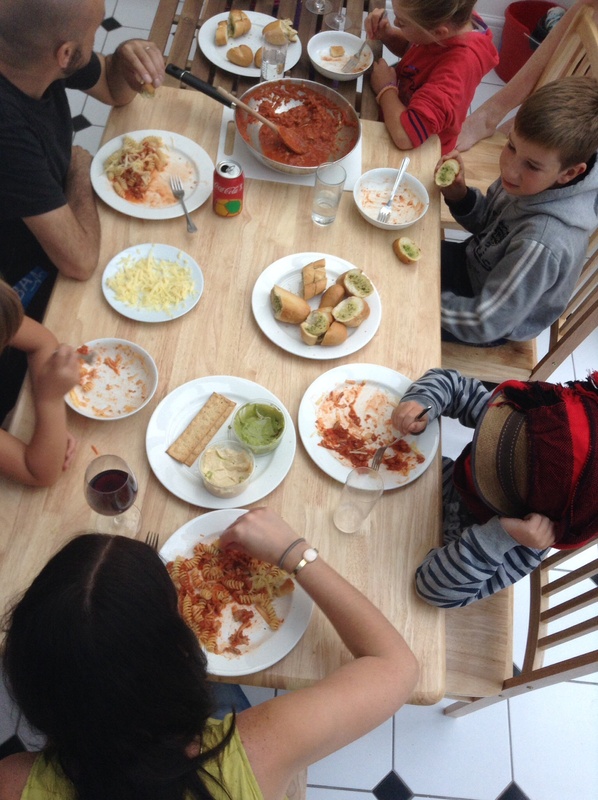 9 kids, 4 adults; laughter, food, Vipassana meditation memories hide and , hide and seek, ‘live dance’ sessions, World Cup soccer, nana Kiran, trampolines, connect four, monkey business in doorways and toast and baileys, again will feed our fond memories. And pinky promises of our next catchup being in Krishna’s hometown in Kerala, India. Mountains of MiliKing love to this impactful and special family. 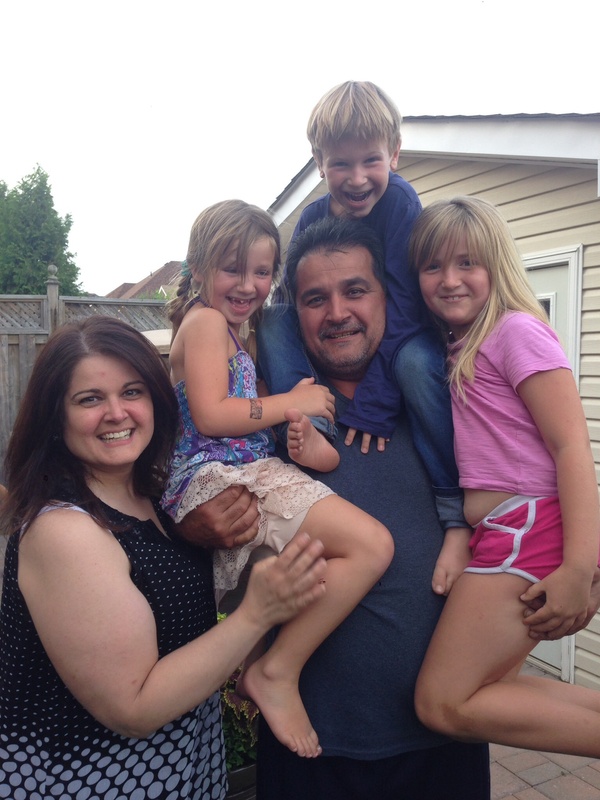 The Krishnadas family are half Indian and half English and they are all very very fun to play games with. Rohini, Aditya and Sarika all went to school but Kiran is having two months break until she goes to college to do years 11&12. So we hung out with her while the others went to school and we went to a big park and climbed on trees and rolled down hills. We also played hide and seek in front of a castle on their university grounds. One of the nights they made us Indian food and it was amazing! All the different flavours in the curry and the bread was delicious. Aditya is like a monkey and climbs up everything. He’s good at climbing and backflips. 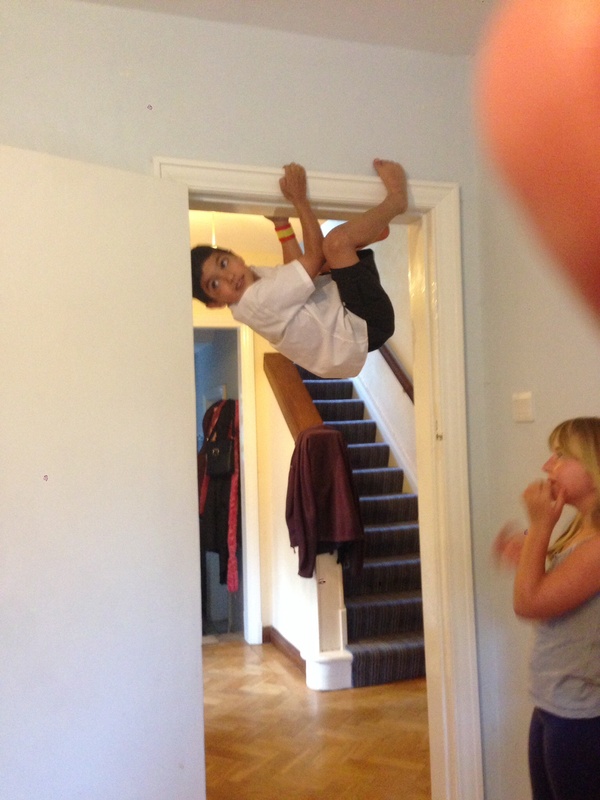 Aditya taught us how to climb the wall, like a monkey. Kiran had finished high school and we got to play lots with her. I liked playing Connect 4 with Rohini, Kiran & Aditya. 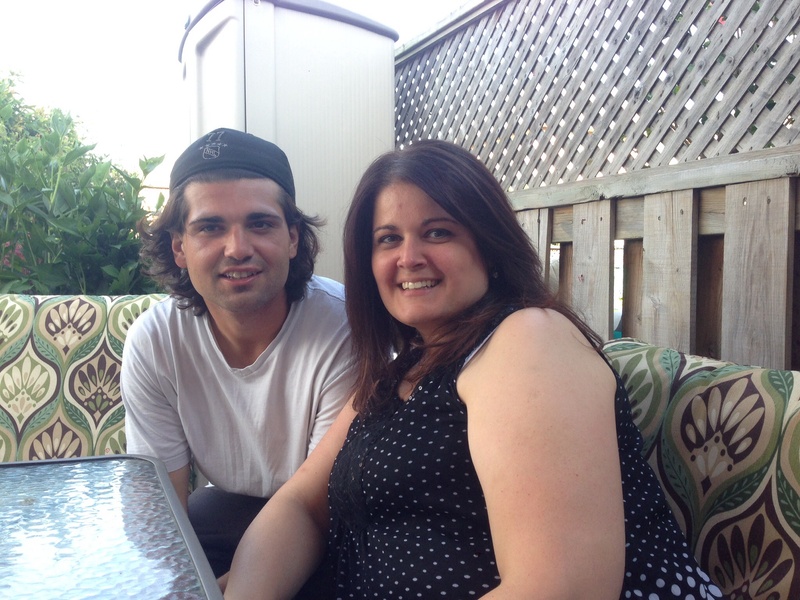 Each morning I walked Sarika and Aditya to school – I liked walking through the woods. They cooked us an Indian dinner that was delicious. All the flavours are completely different. The bread was very very yummy especially with yoghurt.